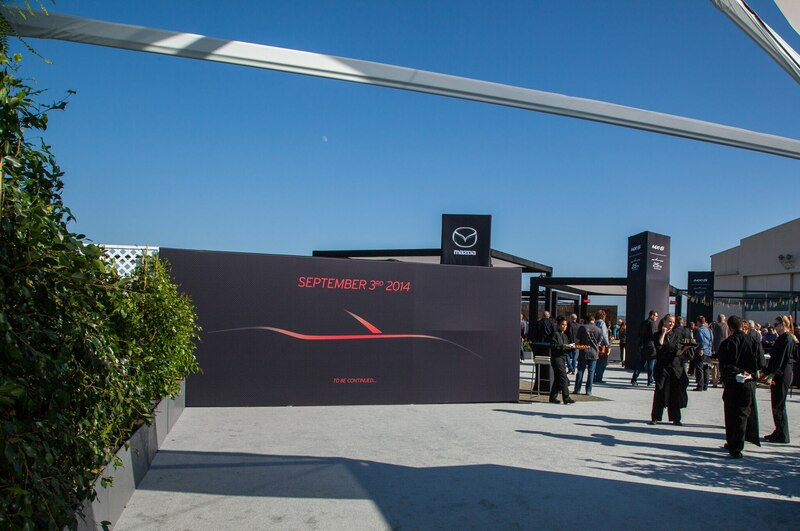 MONTEREY, California – In six days, the most anticipated new product of the year will be unveiled 112 miles north of here, in San Francisco. 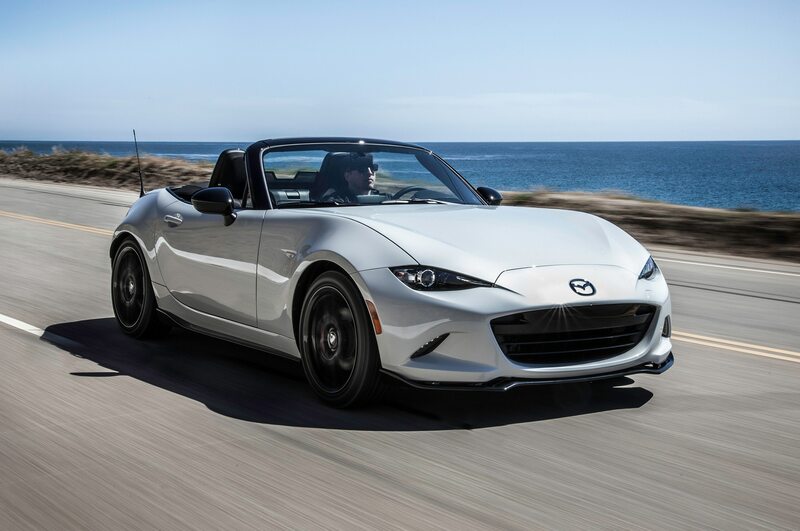 On Wednesday, in a previously undisclosed location close to Monterey, the wraps finally came off of an arguably as compelling new product, the 2016 Mazda MX-5 Miata. 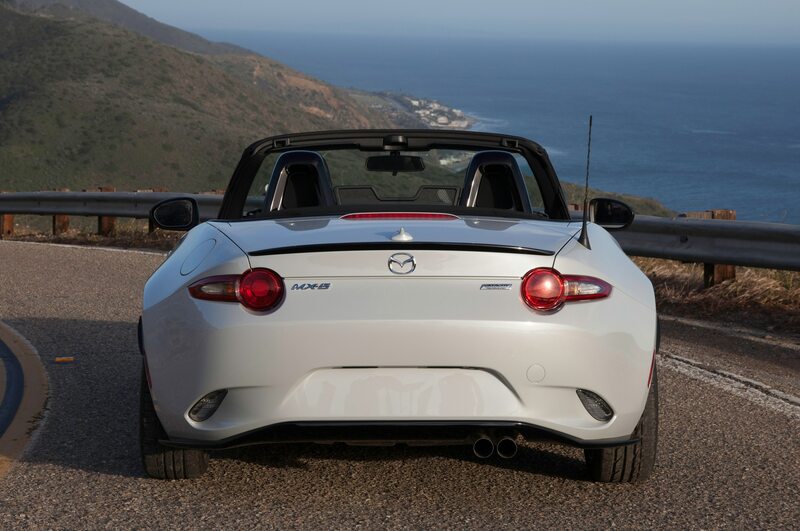 It would be the perfect car for the drive up to San Francisco to see that new smartphone, provided you take your time and meander along Highway 1. 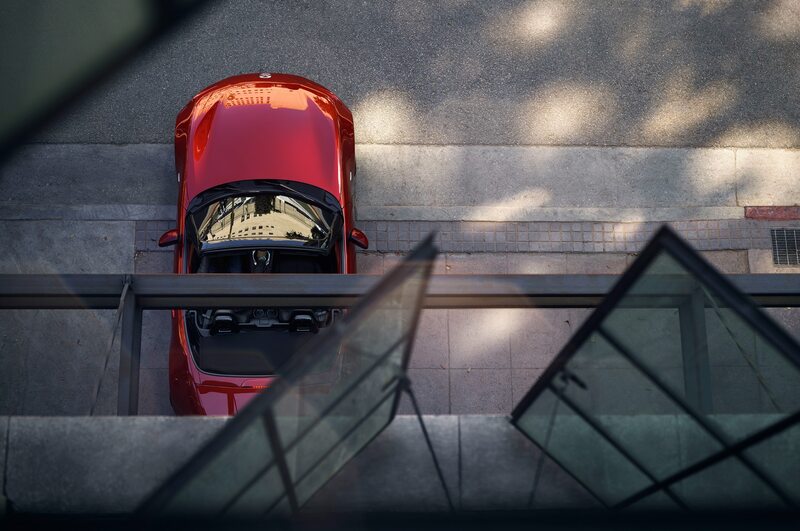 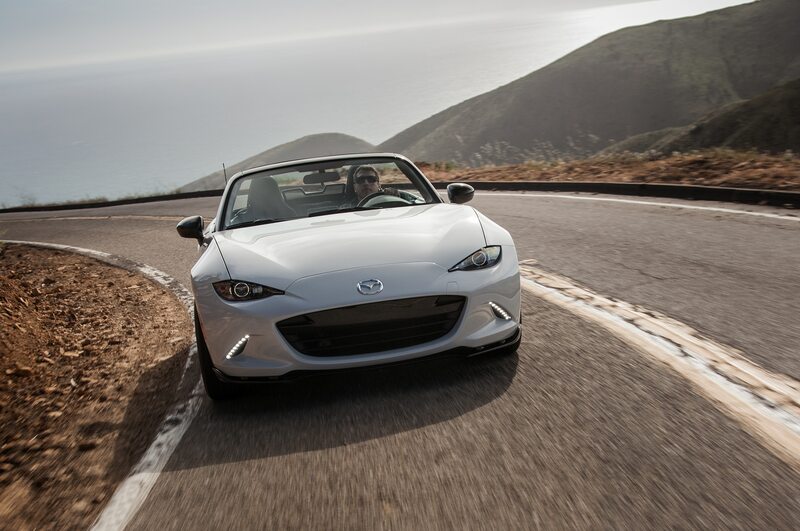 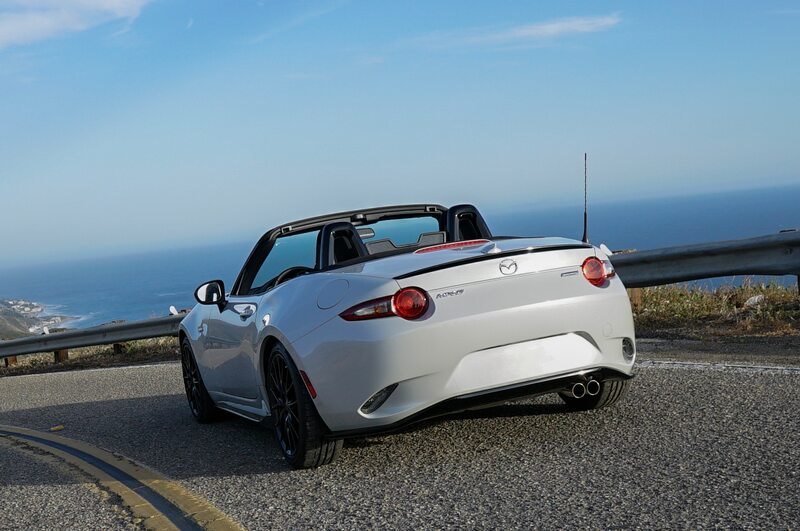 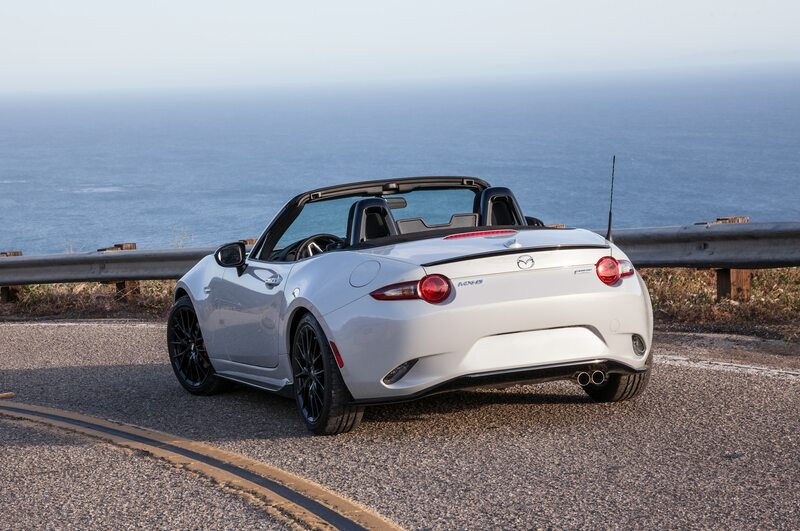 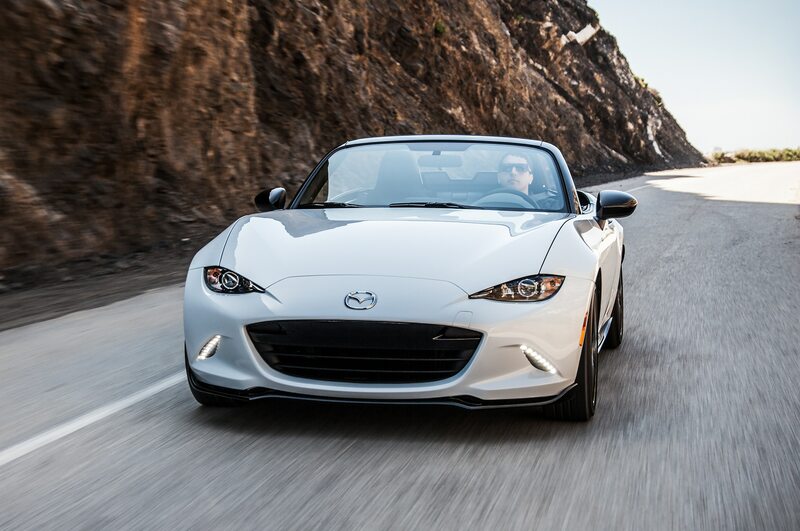 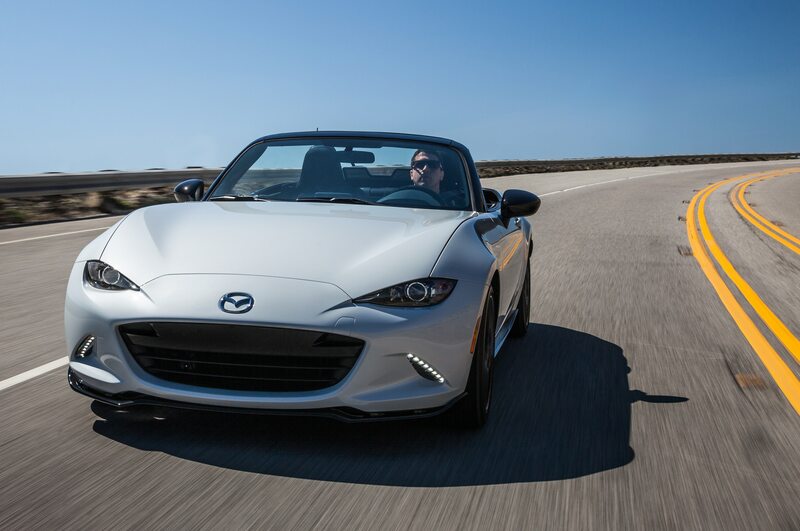 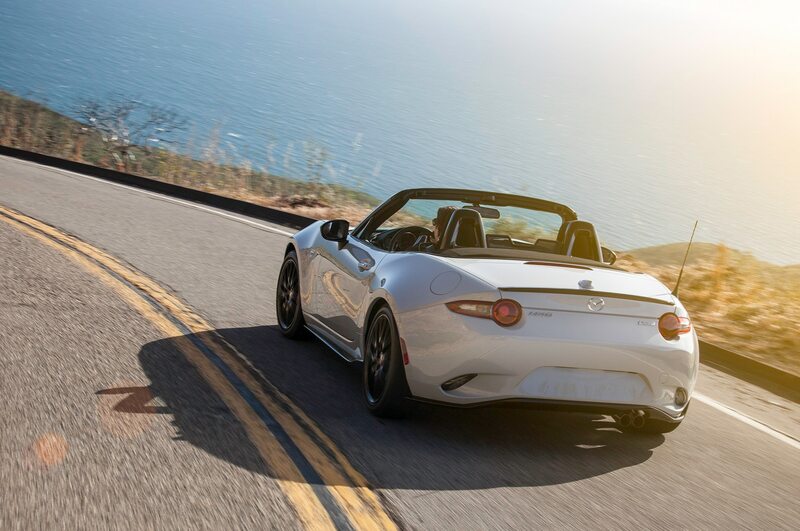 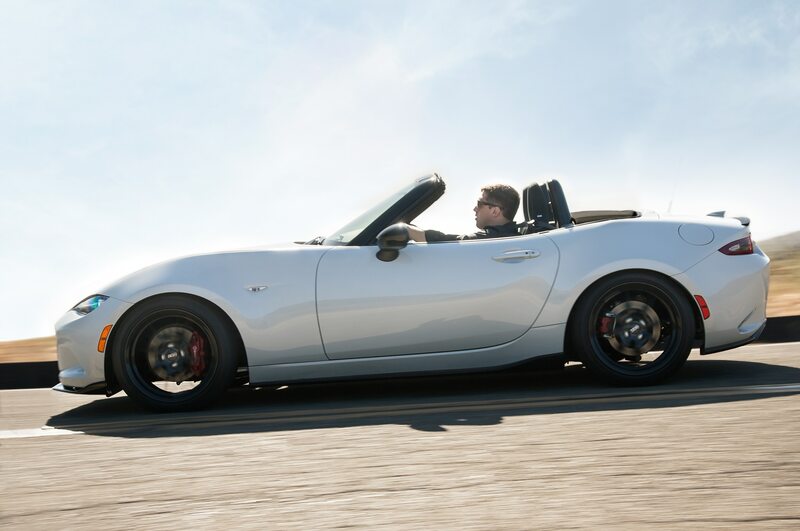 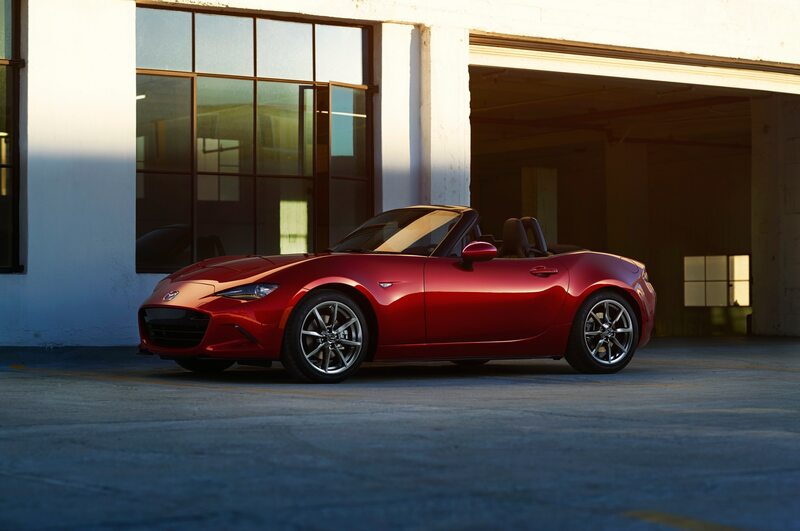 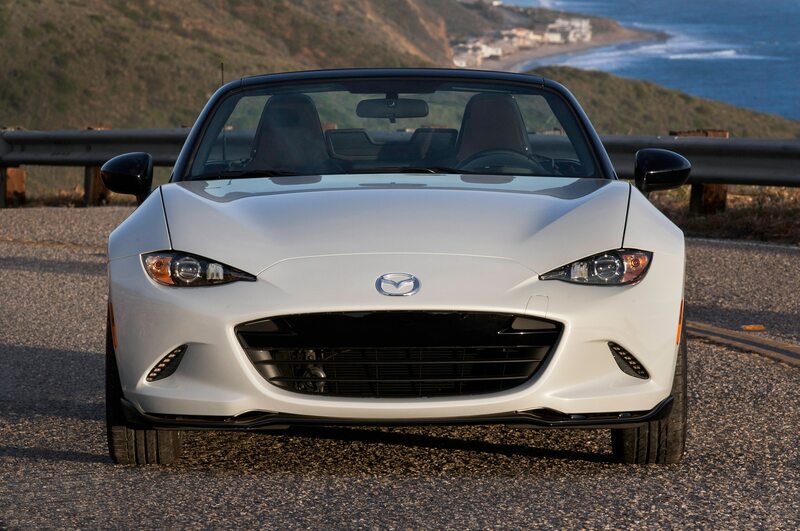 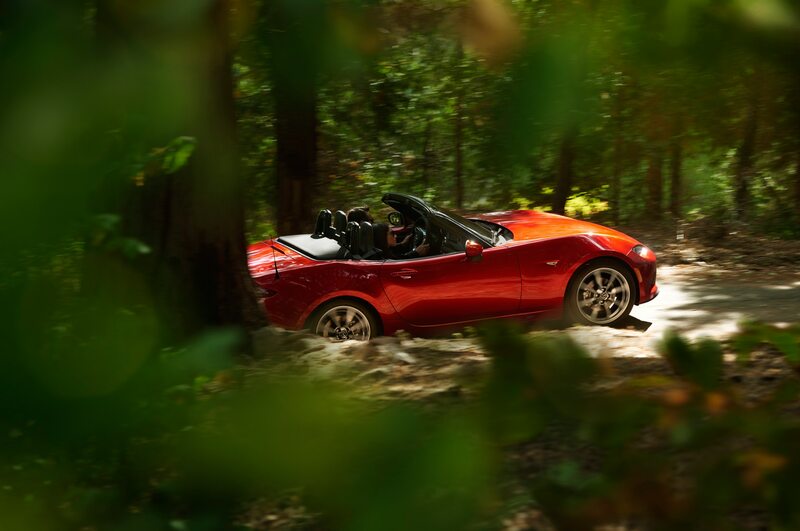 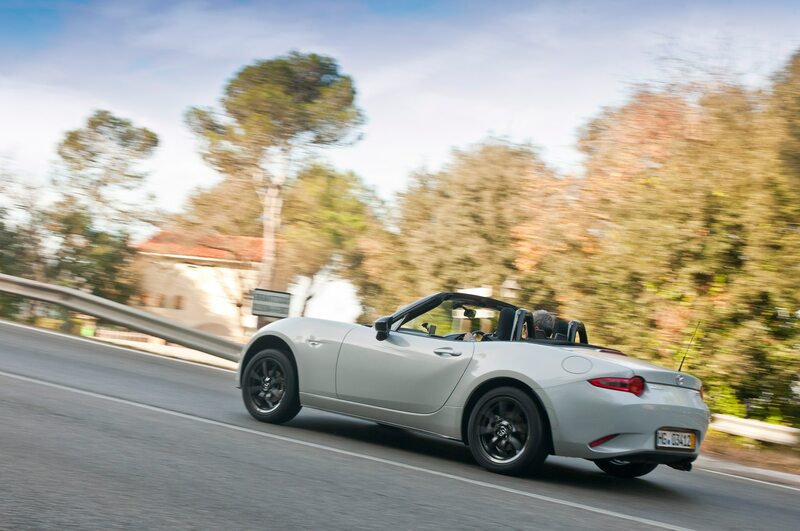 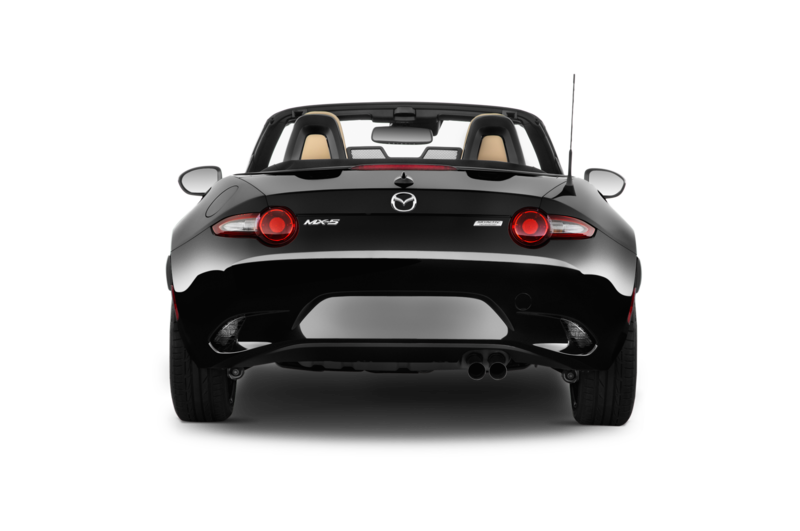 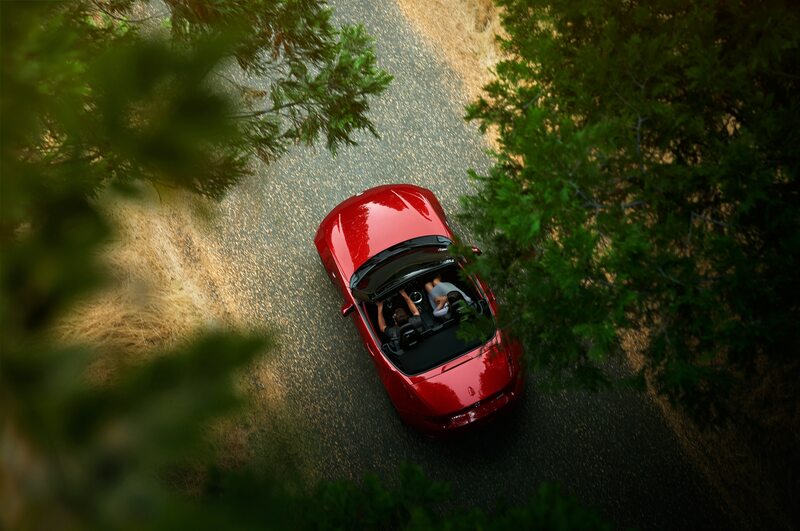 Over the last 25 years, the Mazda Miata has established itself as the perfect sports car for California’s coastal route. 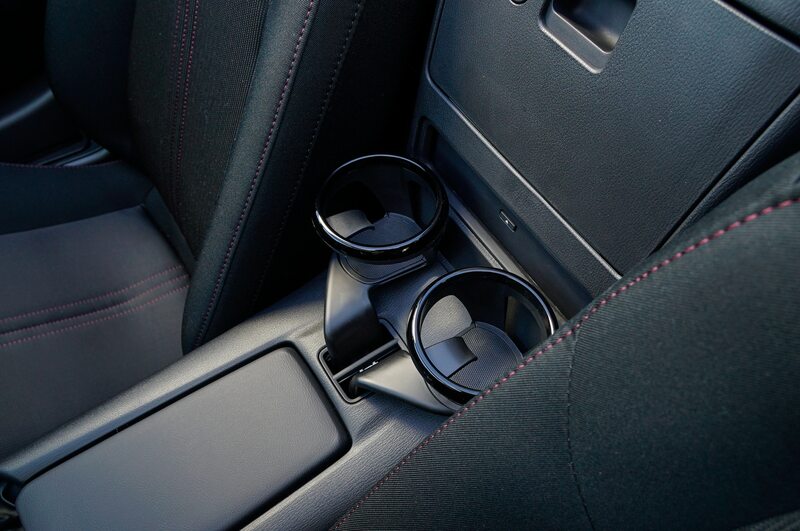 Make sure you lock away your iPhone, perhaps in that little cubby between the two seats. 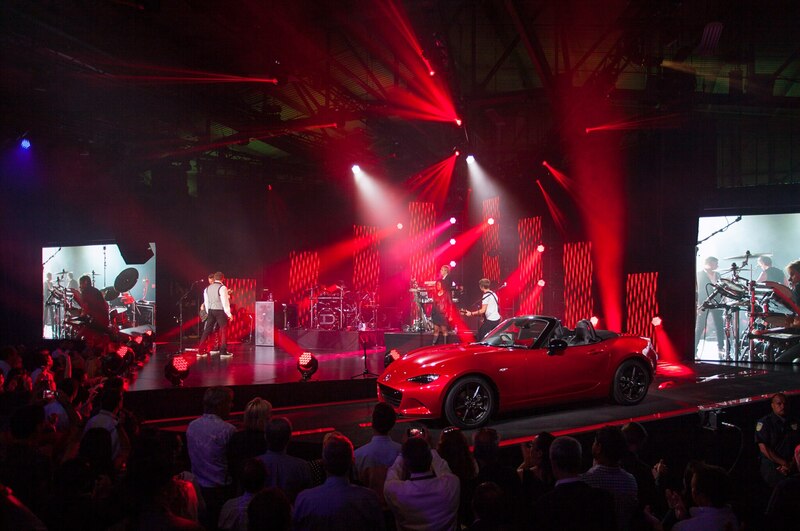 After the big, loud unveiling, and after Duran Duran’s mini-concert, the design details at least of the fourth-generation Miata, also known as ND, came into focus, especially when North American design chief Derek Jenkins gave a Q&A (revealing no more about the engineering or mechanical details) and walk-around for a second Soul Red metallic car (Mazda didn’t even show a second paint color), this one outside in the fading sunlight, this one with left-hand-drive and lightweight 17-inch wheels instead of the unveiled car’s right-hand-drive and lightweight 16-inch wheels. 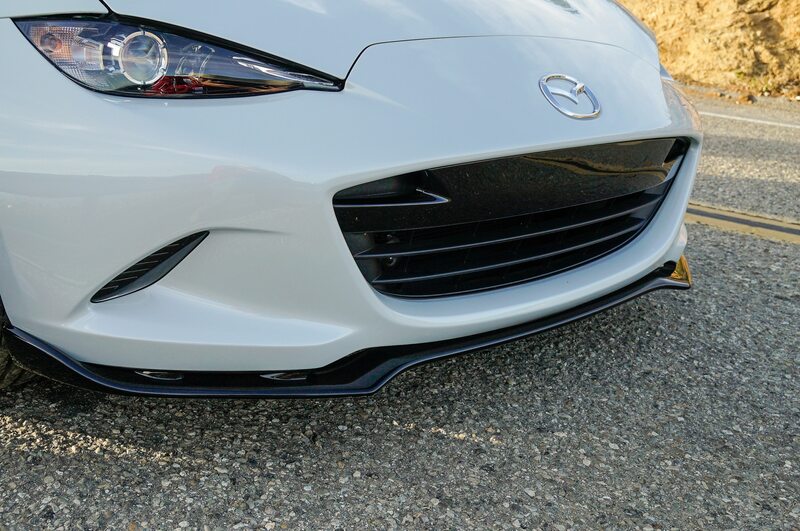 Only from a pedestrian’s view of the long, low hood is it apparent how deep the draws are in the new 2016 Miata’s front fender arches. 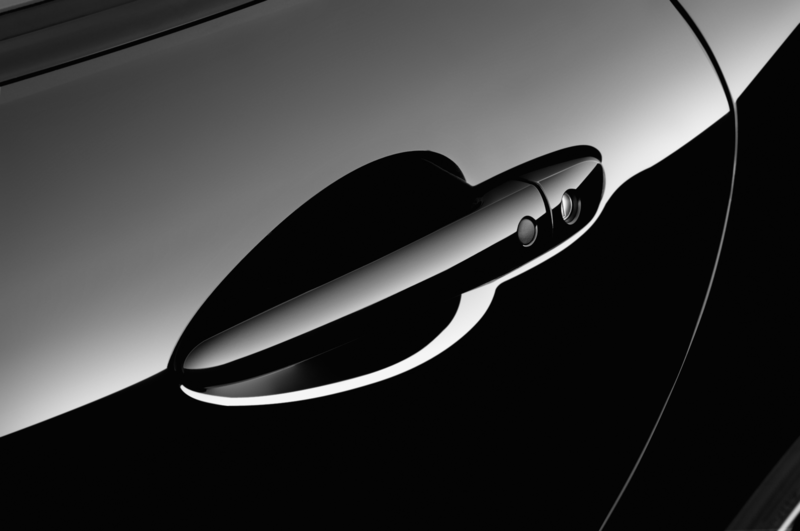 This contrasts with a very organically rounded shape in the long dash-to-axle portion between the front wheels and the front door seam, recalling a big Healey or an MGA. 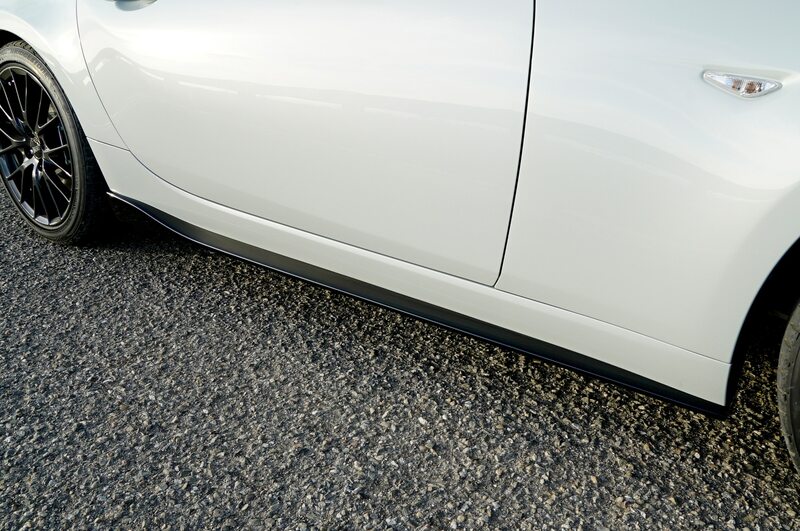 The rocker panels tighten up from the coke-bottle center section, and the only character line in the profile is what Jenkins calls a “hip line,” a rather subtle crease starting in the middle of the door upward to the rear fenders and to the back of the softtop. 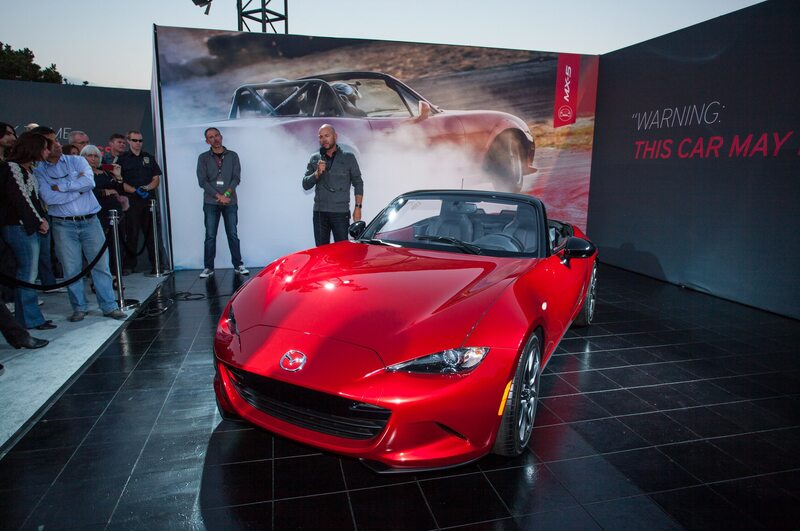 “There was a strong feeling that the car needed to be modernized,” says Jenkins. 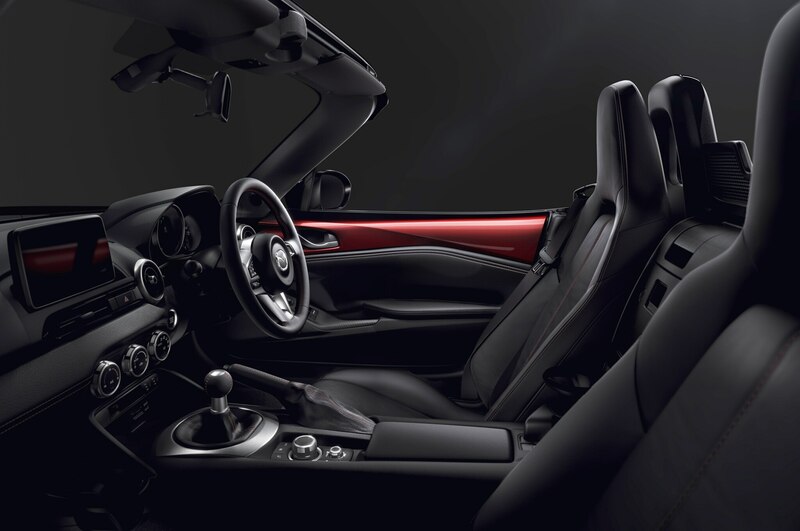 So the design team penned a longer, lower hood, pulled the A-pillar — now blacked out — further back, and raked the windshield even more. 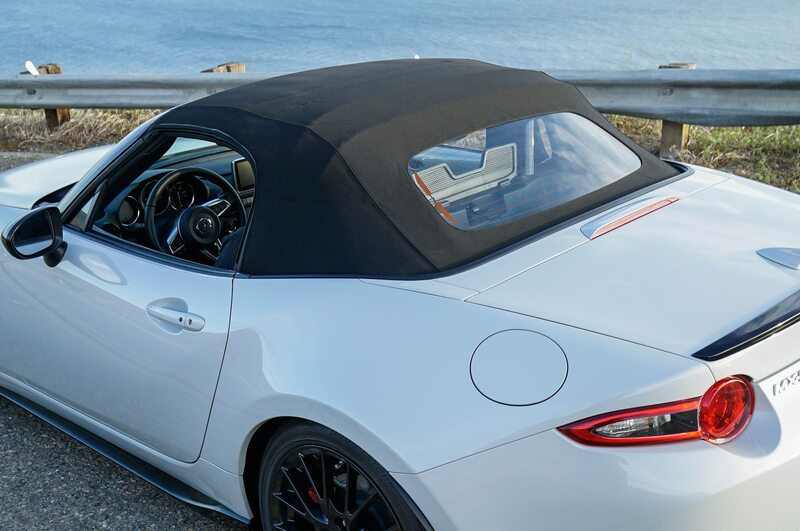 The hood dips to a short front overhang, Jenkins says, and uses a mechanical solution to meet European pedestrian-protection standards. 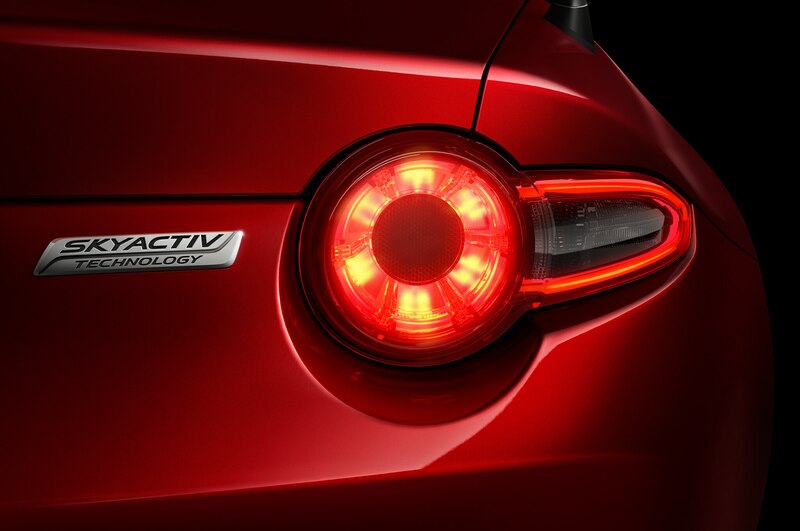 All exterior lamps are LEDs. 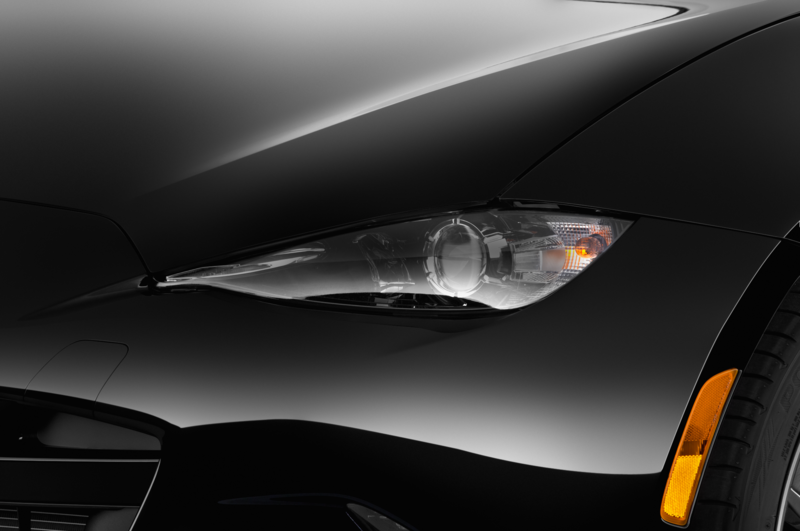 The front turn signals are outside the headlamps, with daytime running lamp LED light pipes along the inside edge of the thin headlamp cover. 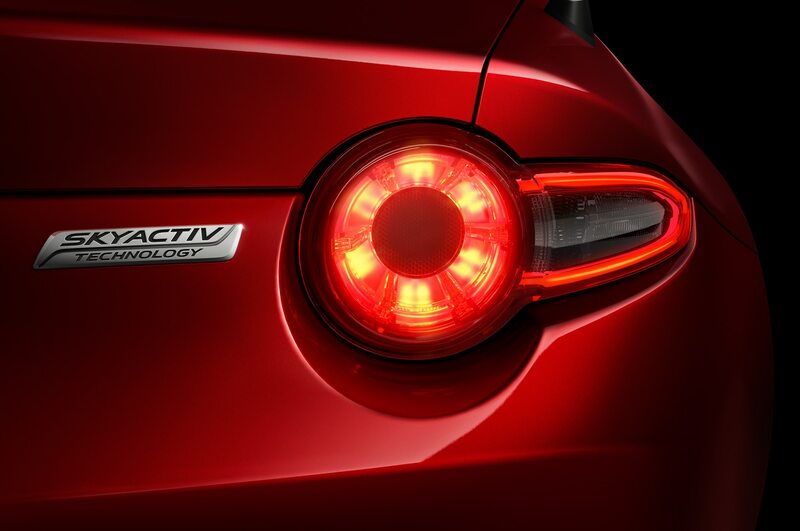 The thin cateyes are only possible because of the use of LEDs, the designer says. 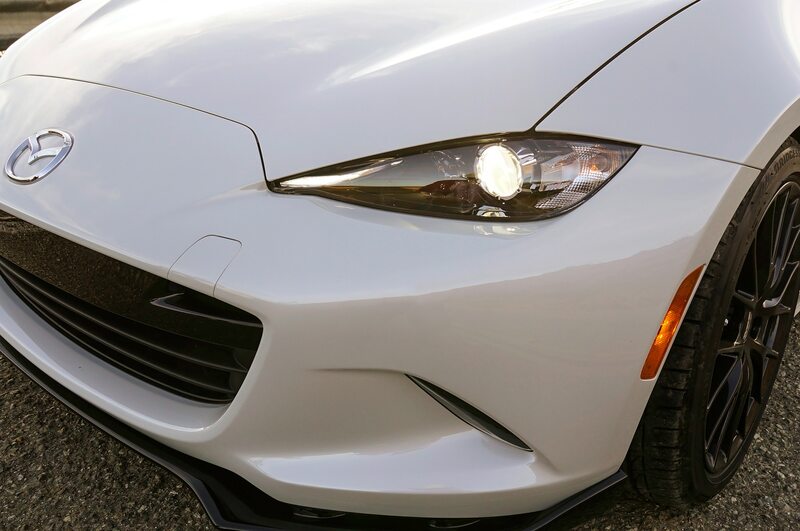 The grille is very reminiscent of the Jaguar F-Type from certain angles, though if you have to copy another, more expensive sports car, Jag’s a good place to start. 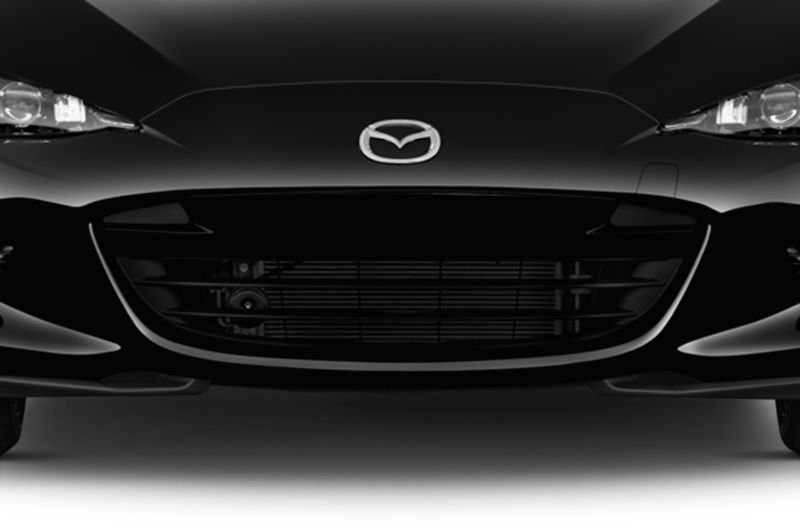 The designers also gave the nose a more contemporary feel while losing the “smiley face” of the present car. 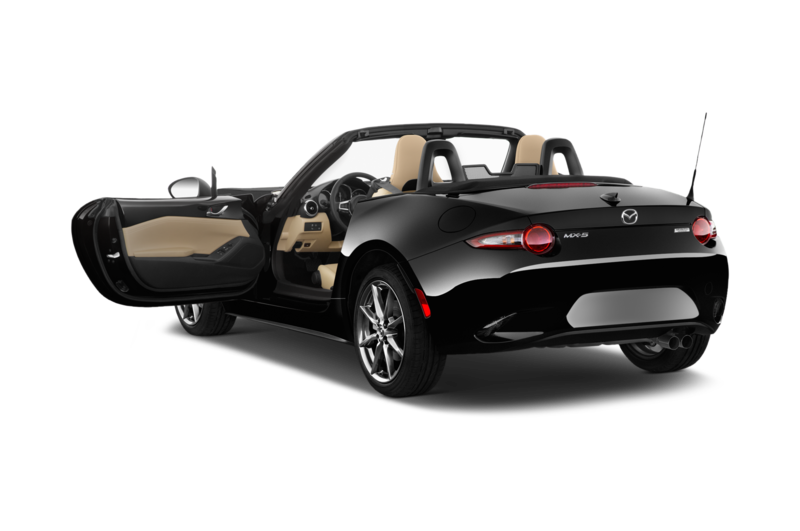 Another thing the new 2016 MX-5 is losing is weight, reportedly some 220 pounds or so over the outgoing car’s roughly 2,480 pounds. 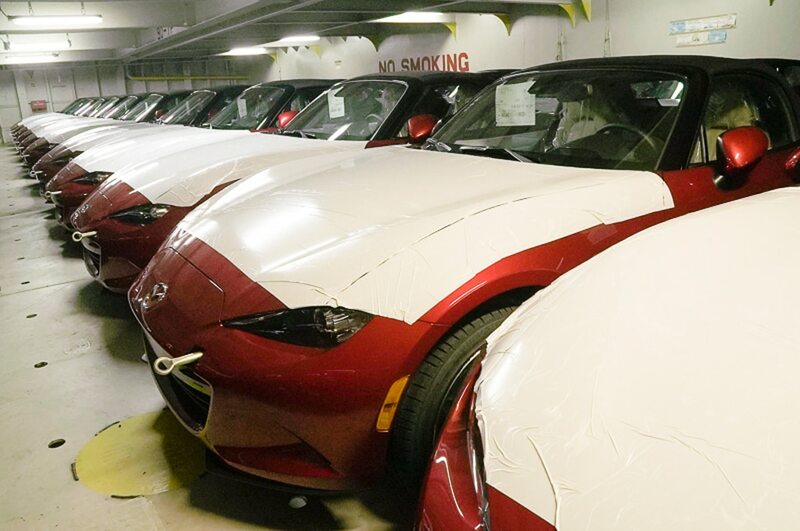 Mazda’s senior vice president of U.S. operations, Robert Davis, says Jenkins and his U.S. team “heavily influenced” the new MX-5 — especially the interior — which calls on Hiroshima’s kodo design language. 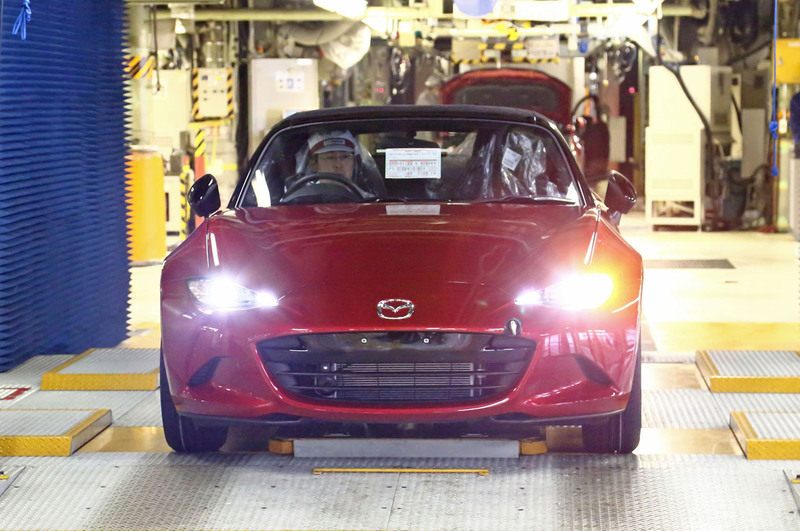 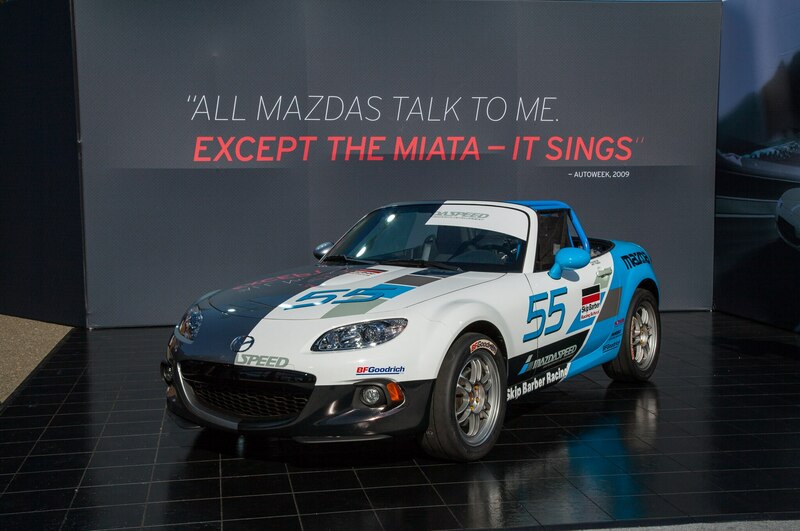 Mazda called on another Japanese term, monotsukuri, to develop the 2016 Miata more efficiently than it would have under former owner Ford Motor Company’s control. 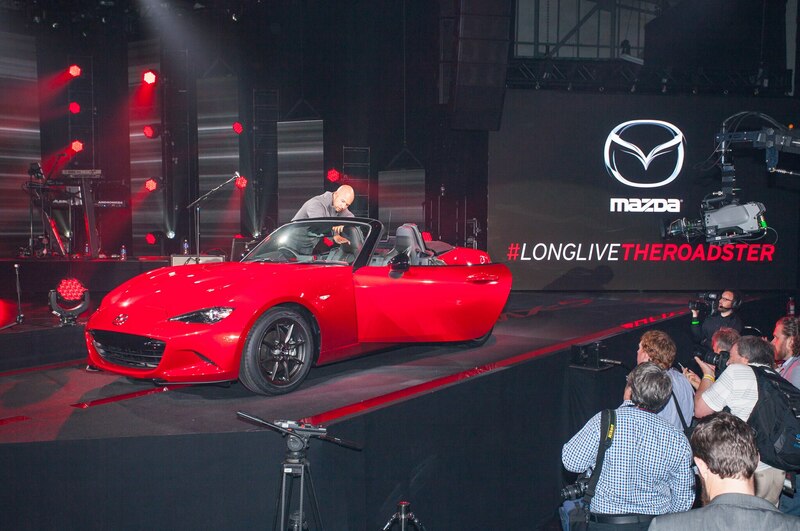 “It roughly translates into ‘collaboration’ — bringing vehicle development, suppliers and the design group together all at once,” Davis says. 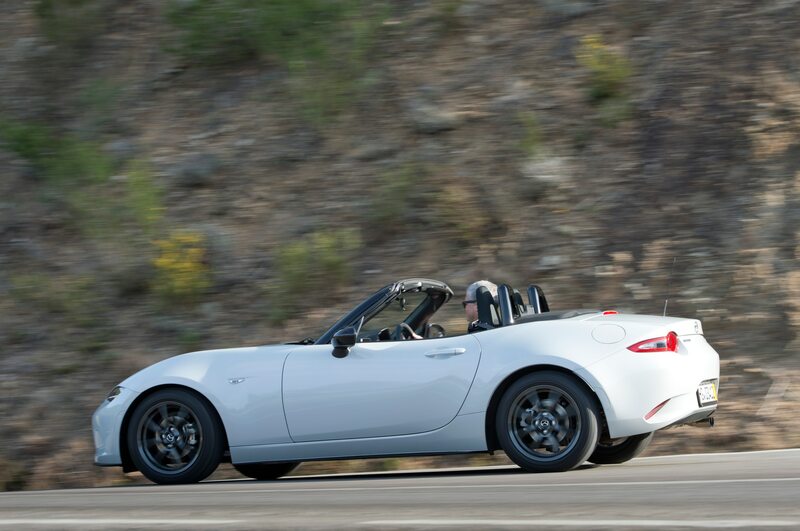 Looking back from the ND, the first three Miatas might be described as “spindly”; the fourth contrasting as much as the MGA did to the MGTC/TD/TF before it. 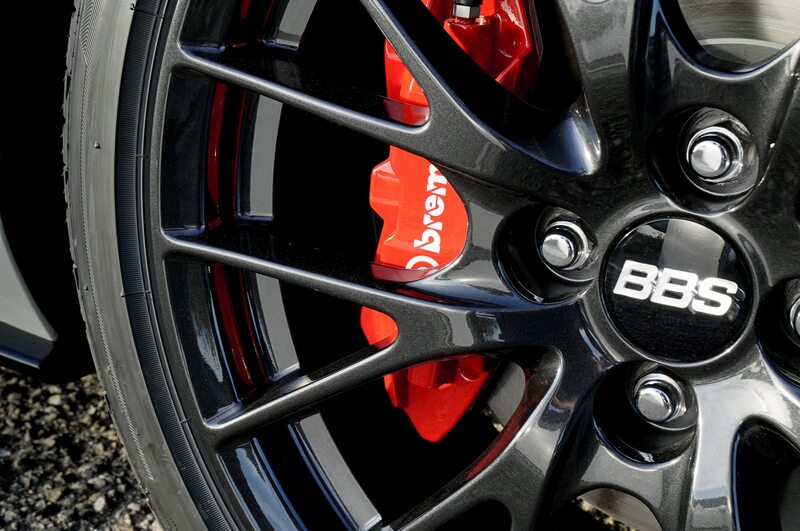 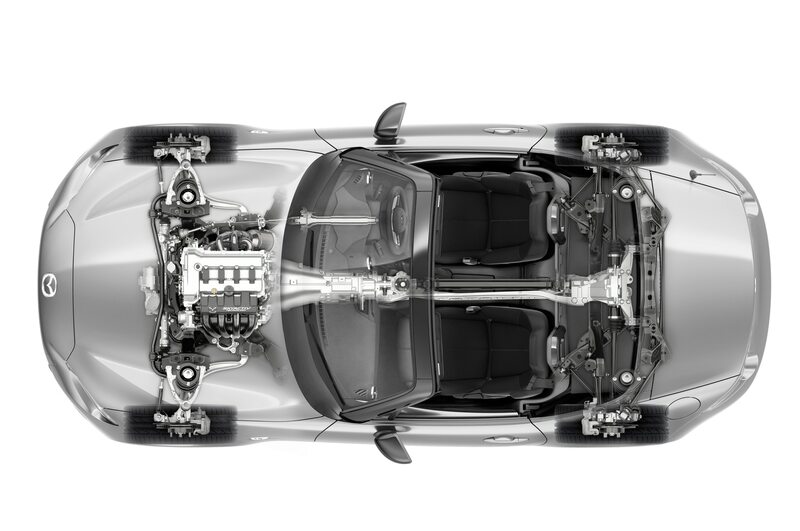 There is some Subaru BRZ/Scion FR-S in the lower body, perhaps an attempt to bury the “girly” car image. 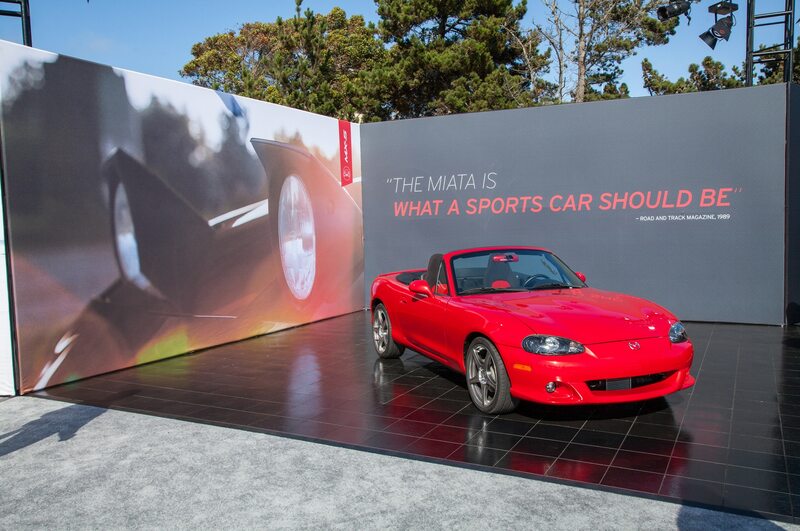 (Our masculinity was never threatened.) 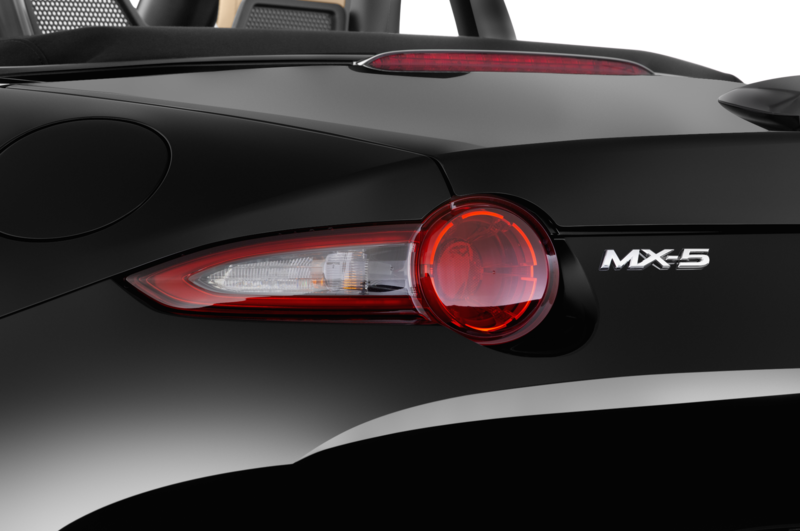 McLaren kiwi-shaped scallops in the lower front fascia are LED foglaps. 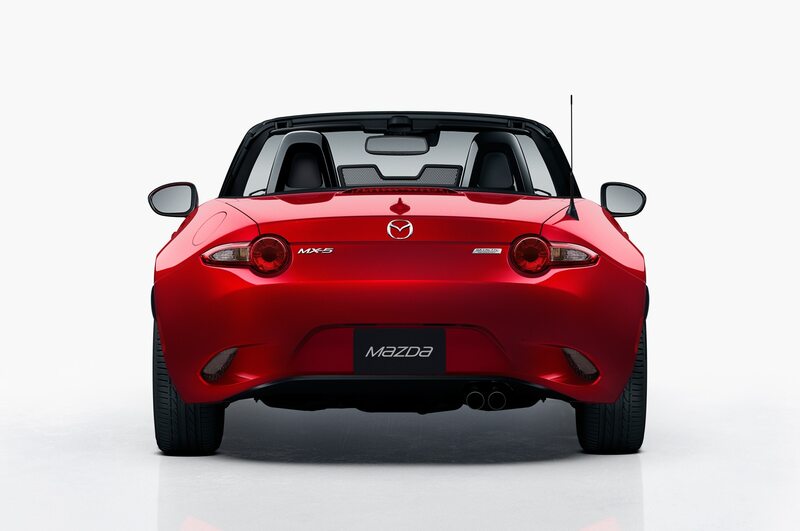 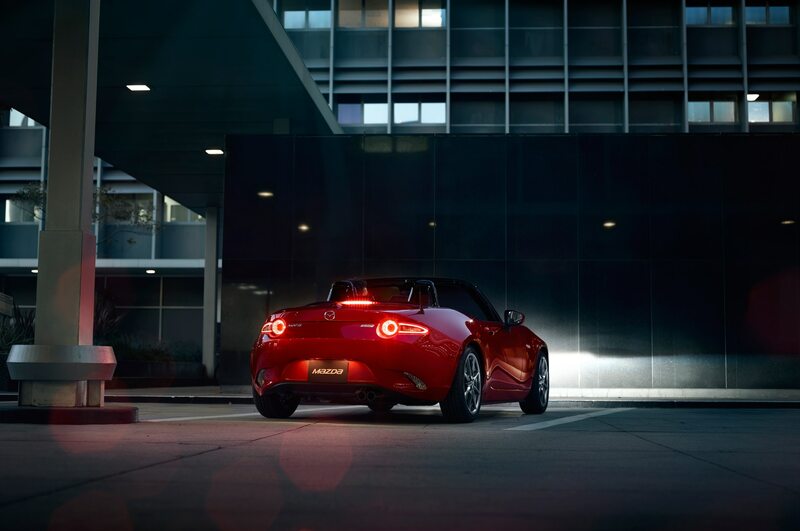 The shape repeats in back as backup lights and underscore more avoirdupois than we’ve seen on an MX-5 before. 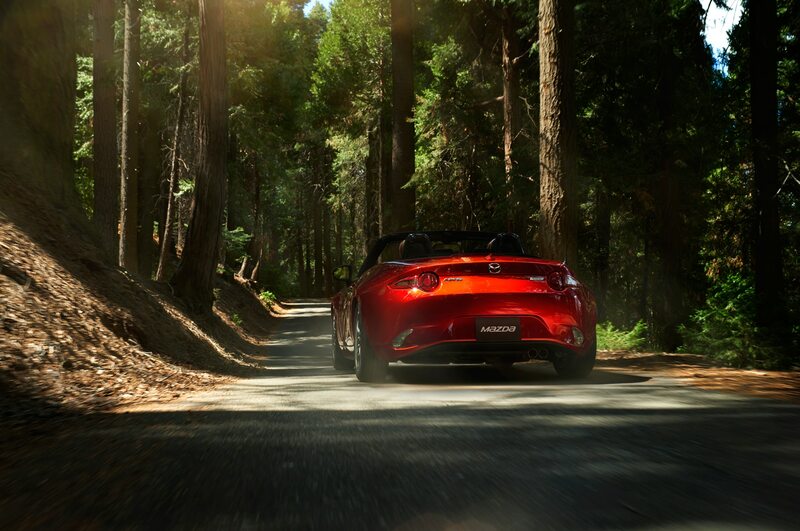 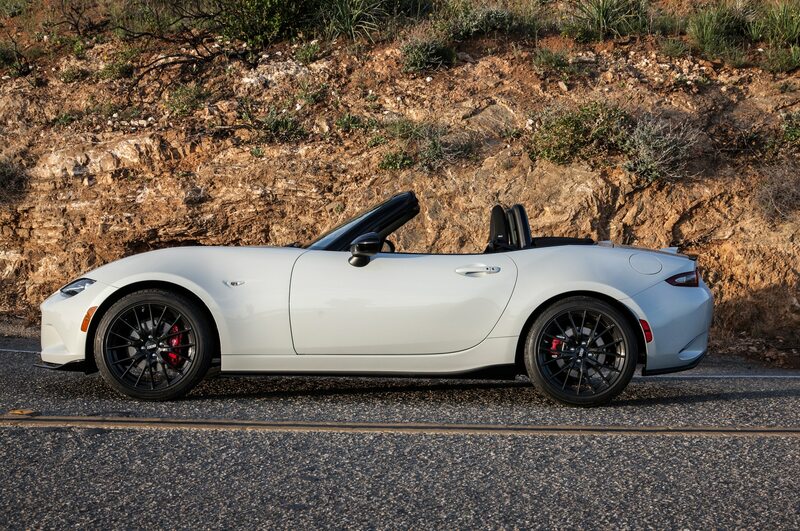 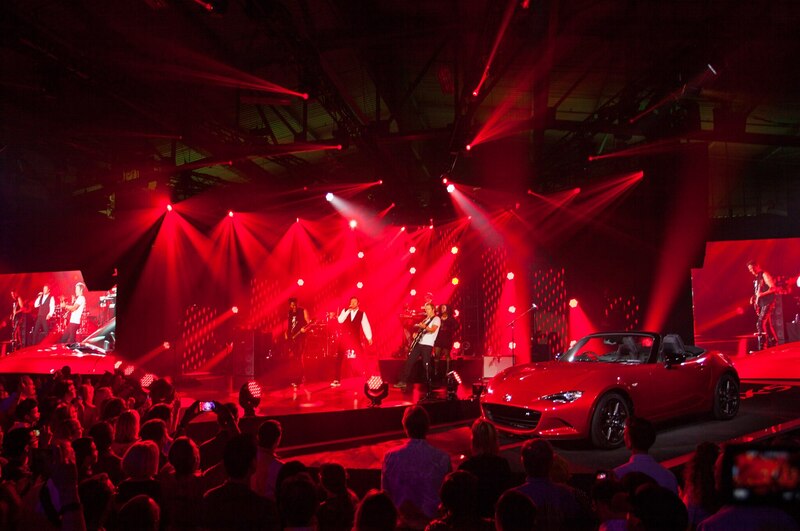 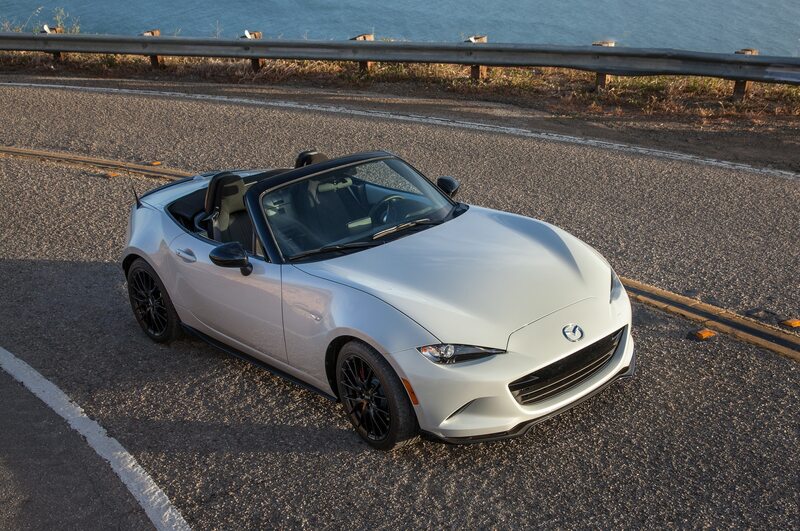 The only hint of Lotus that remains is in the new Miata’s lighter weight. 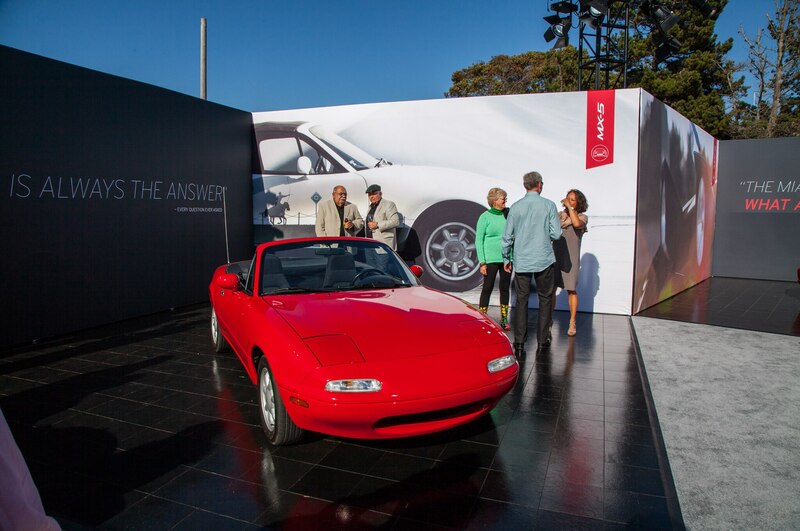 “The Lotus Elan is in the car’s DNA, but the visual connection to the Elan is more distant,” Jenkins says. 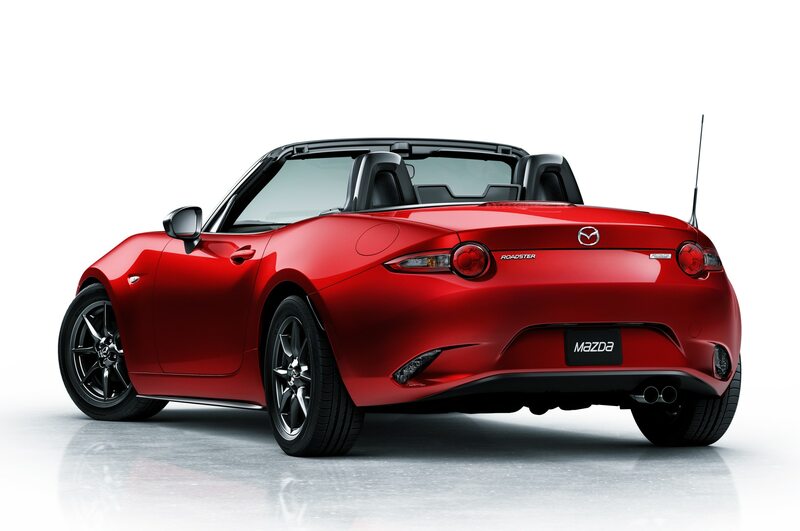 The dip in the beltline, between more dramatic fender flares, gives it more of a Coke bottle shape, Jenkins says. 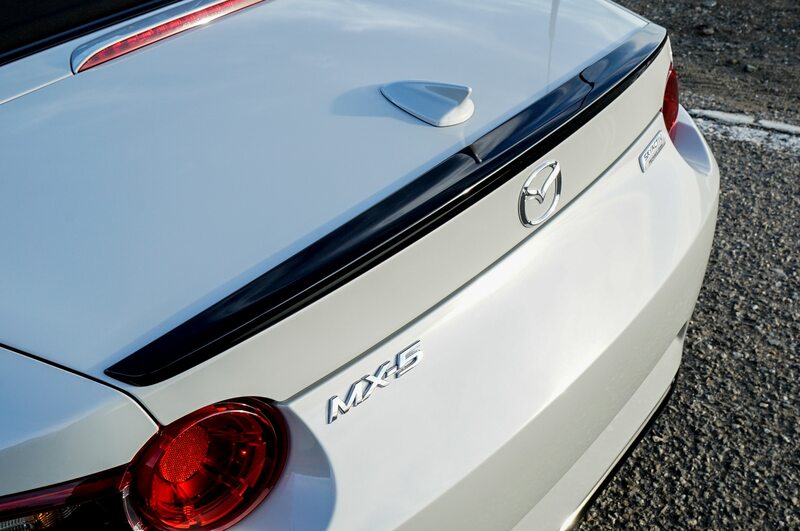 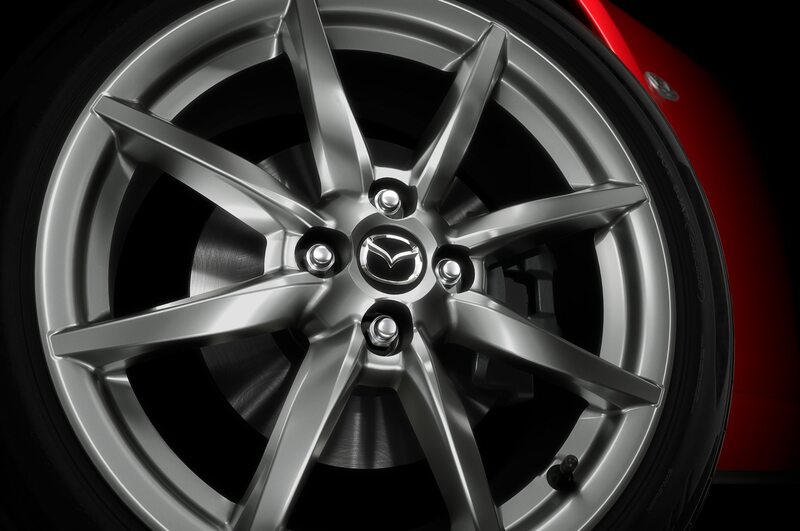 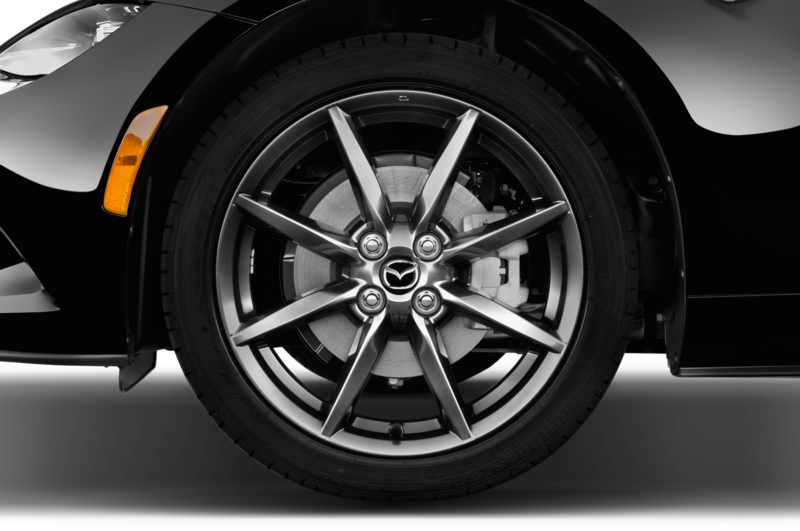 The flush lower front-fascia connects with other Mazda products, but “not directly … there’s a lot of taper toward the rear.” The creased lower-rear fascia almost suggests a bustle-trunk, though the rear deck is a straight plane. 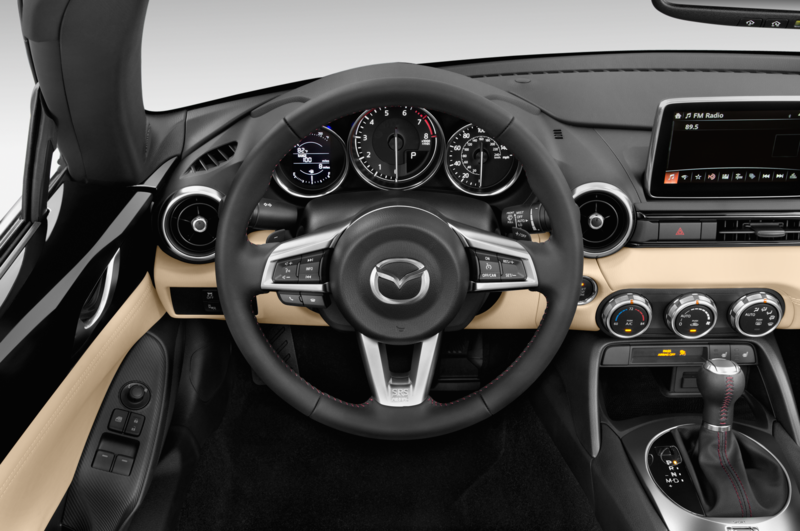 Inside the cabin, designers “made the dashboard as thin as possible” while meeting safety standards, Jenkins says. 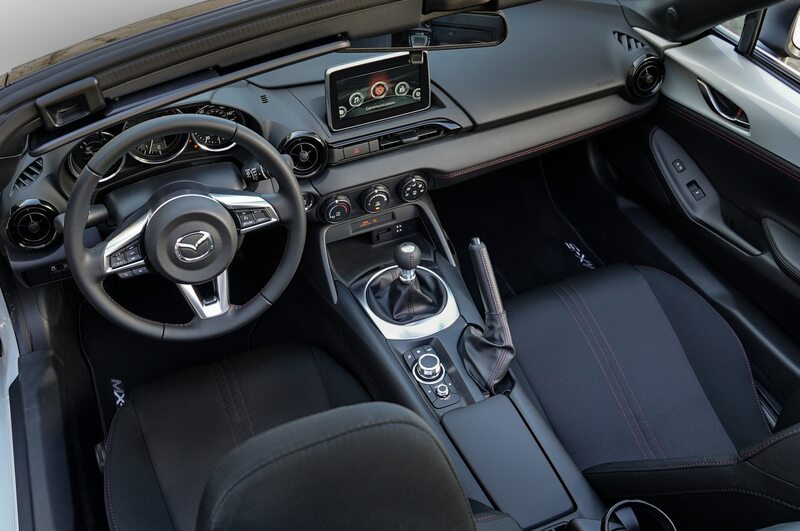 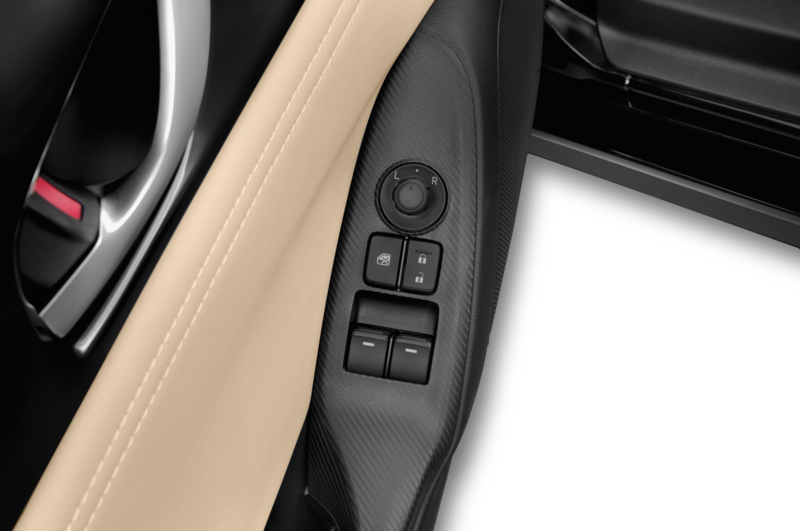 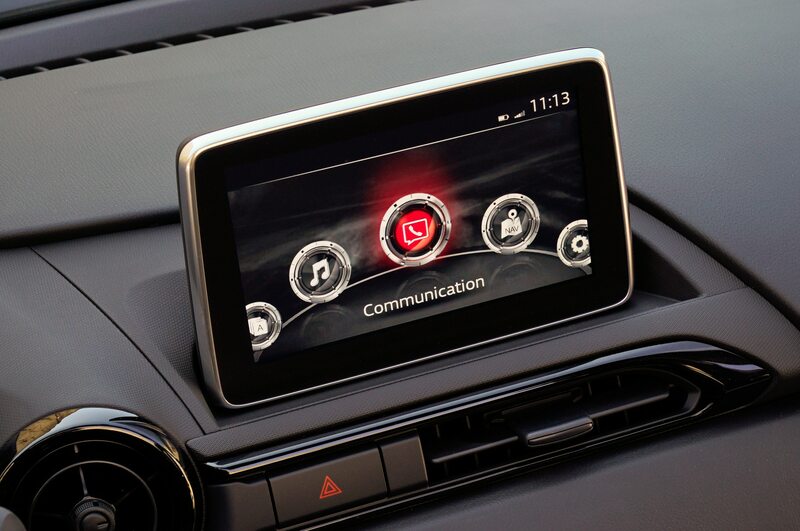 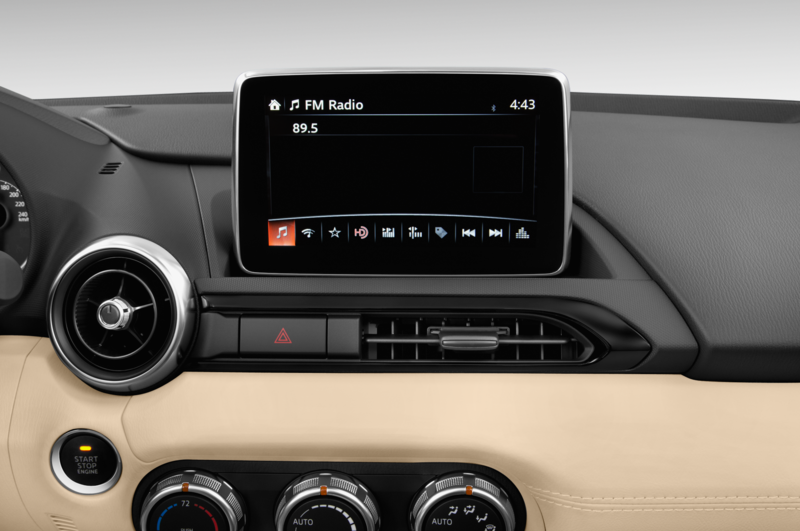 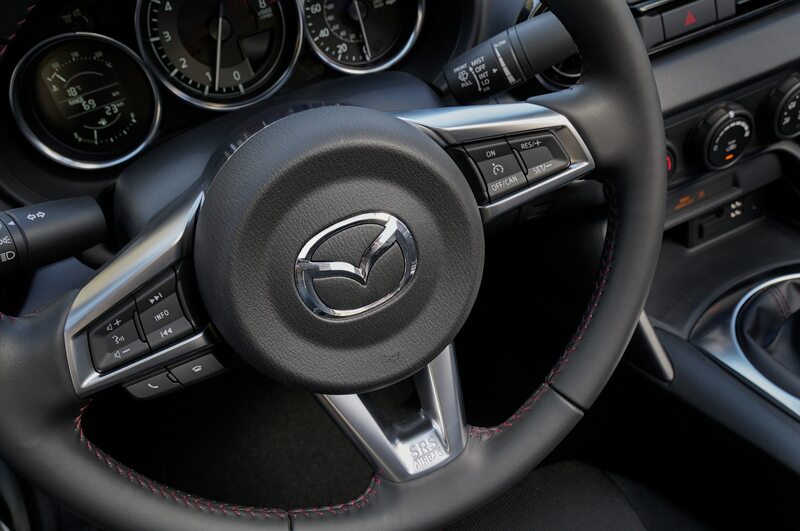 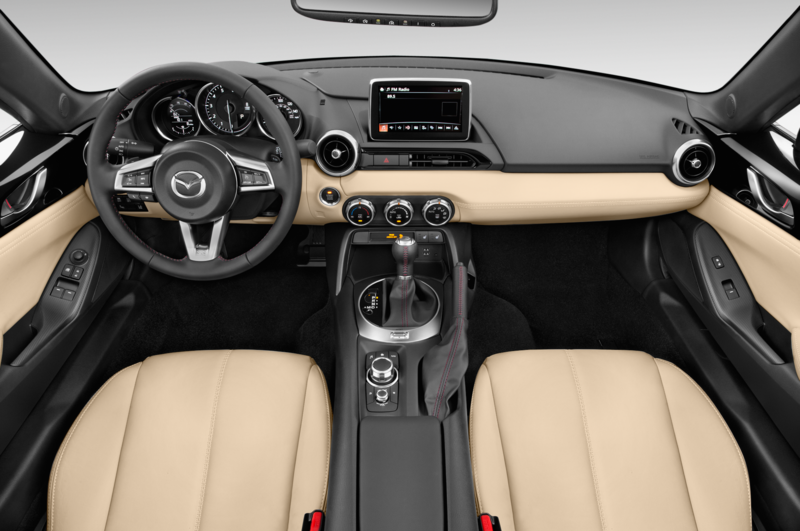 This is possible in part because the ND Miata adapts the fixed stand-up display panel with a rotary dial just below the gearshift, like the latest Mazda3 and 6. 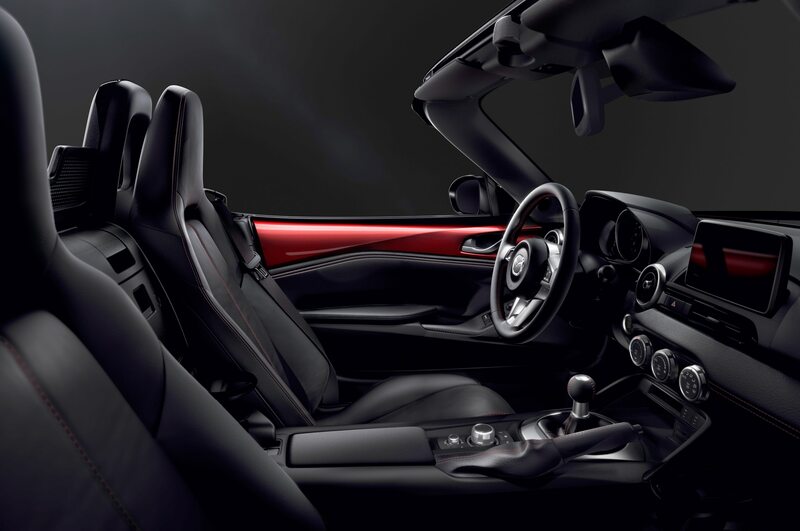 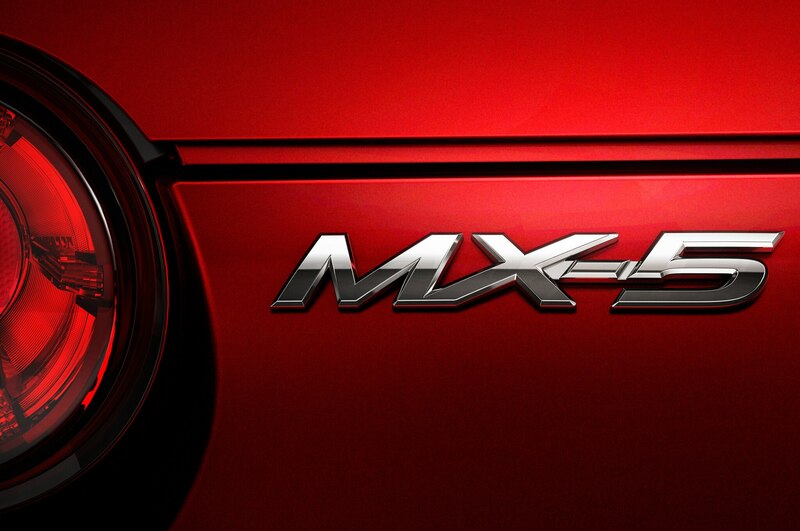 It will be the first MX-5 Miata offered with an optional navigation system. 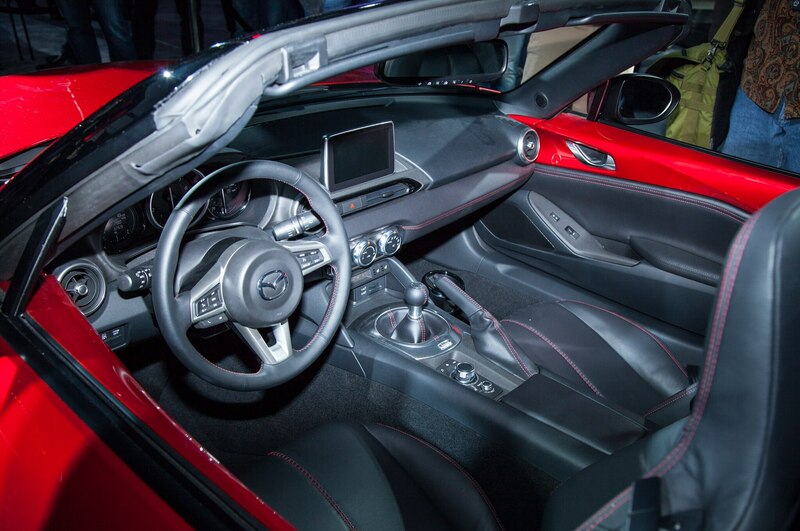 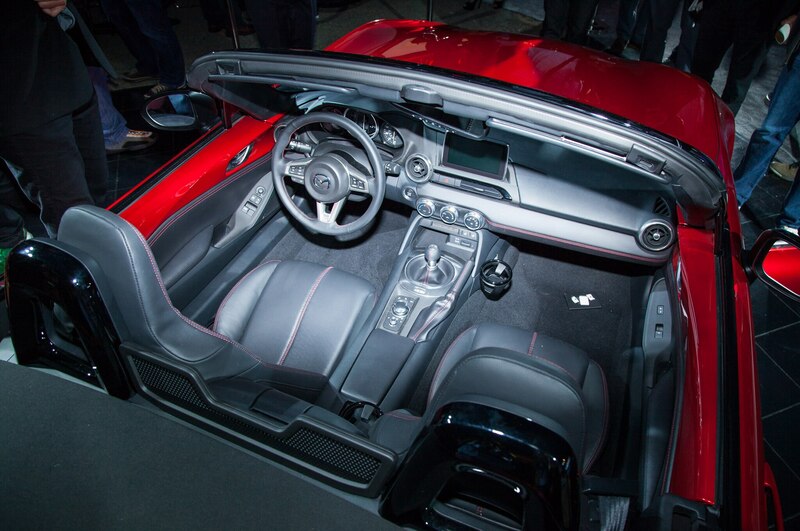 There were two cupholders visible in the second car unveiled; both of the removable sort. 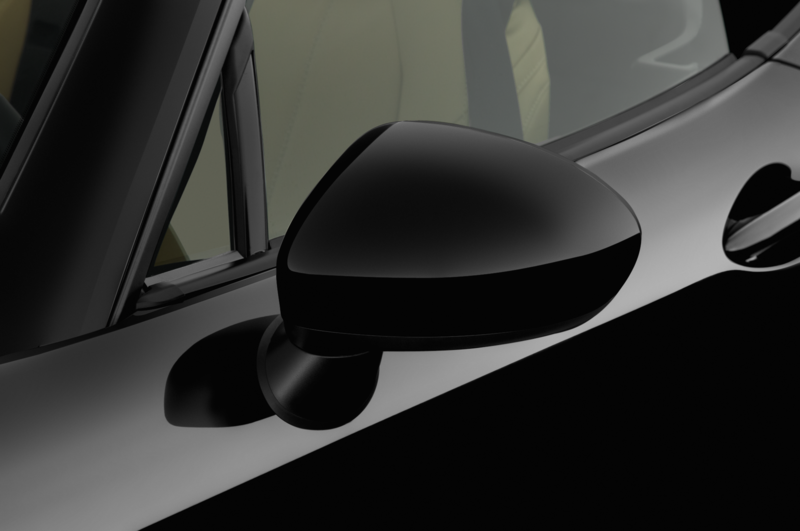 The body-color panels on the upper portion of the two doors are of painted plastic, though you’ll see this only on upper trim levels. 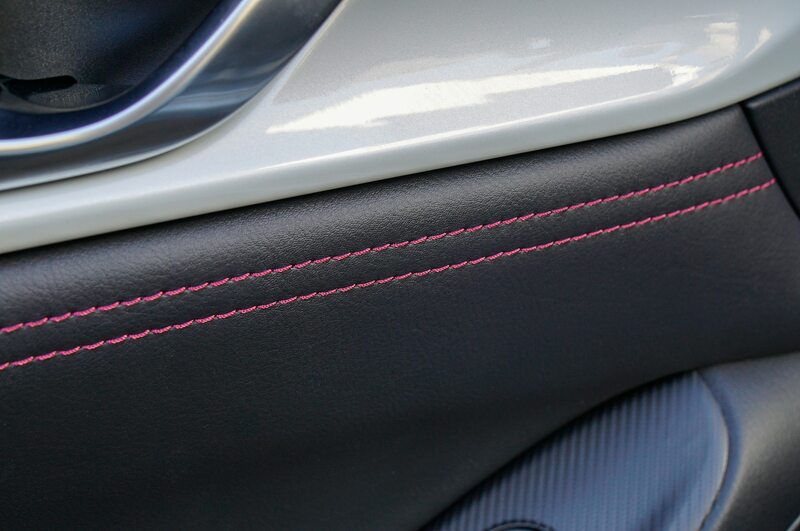 Jenkins would not divulge the material or colors to be used for lower trim levels. 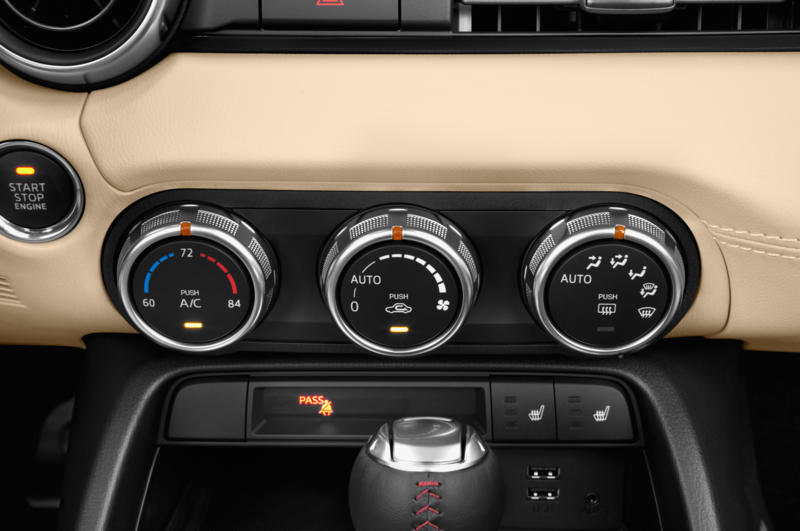 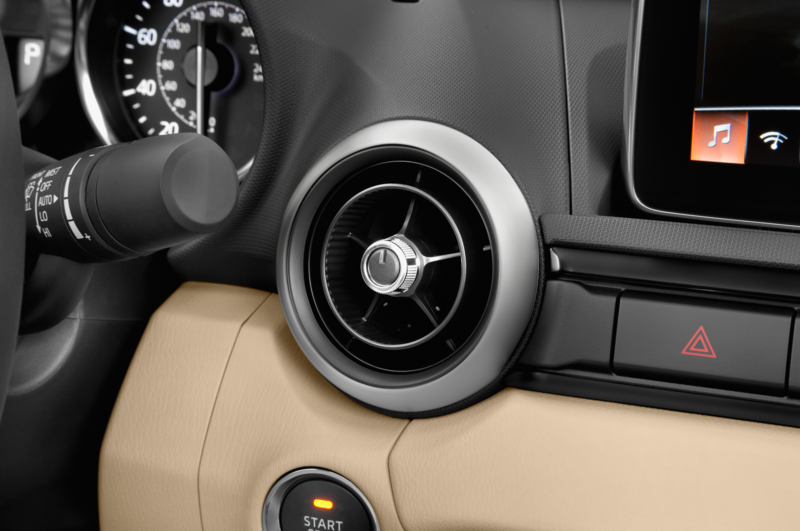 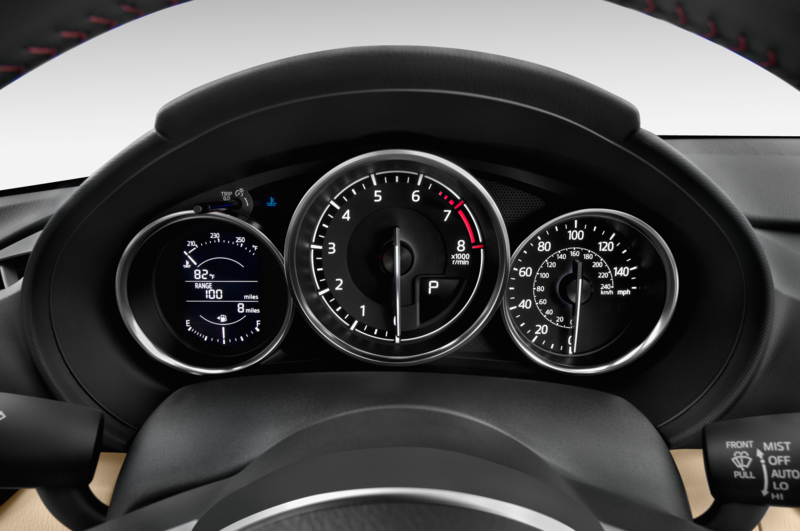 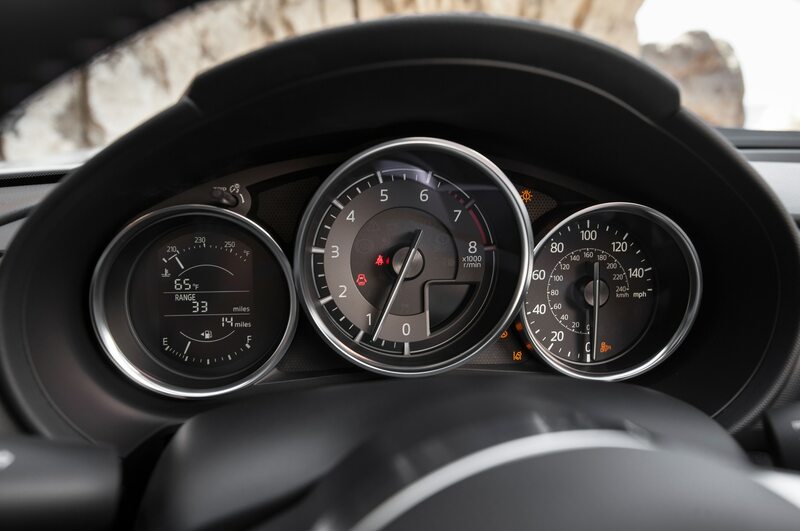 The tach is the most prominent gauge in the car’s traditional three-gauge cluster, and there’s a handbrake again. 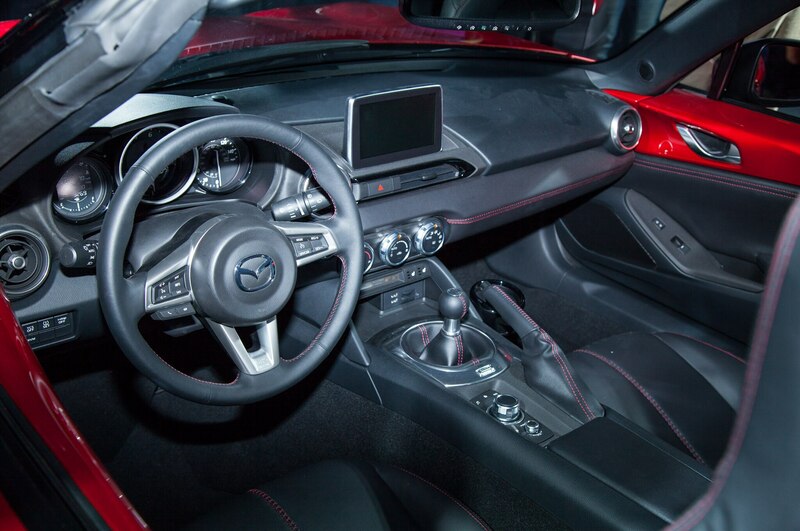 However, a “sport” button, for a car that always should be in “sport” mode, just below the show car’s six-speed manual gearshift with round knob got us in a panic, until a Mazda official pointed out that the display car is an un-driveable mock-up; the “sport” button is for an automatic gearshift, which can be substituted in this car for display purposes. 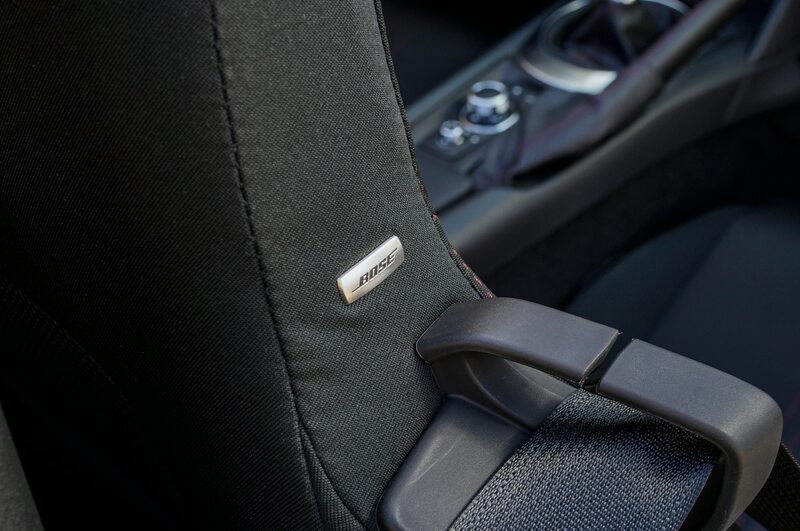 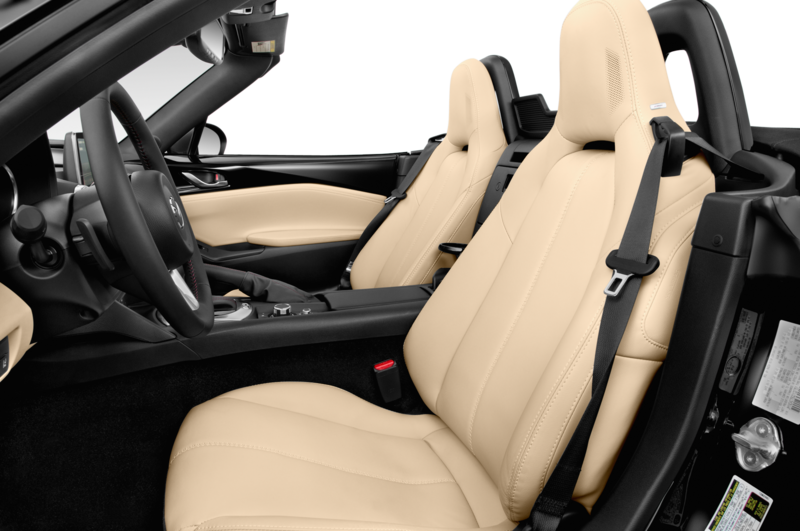 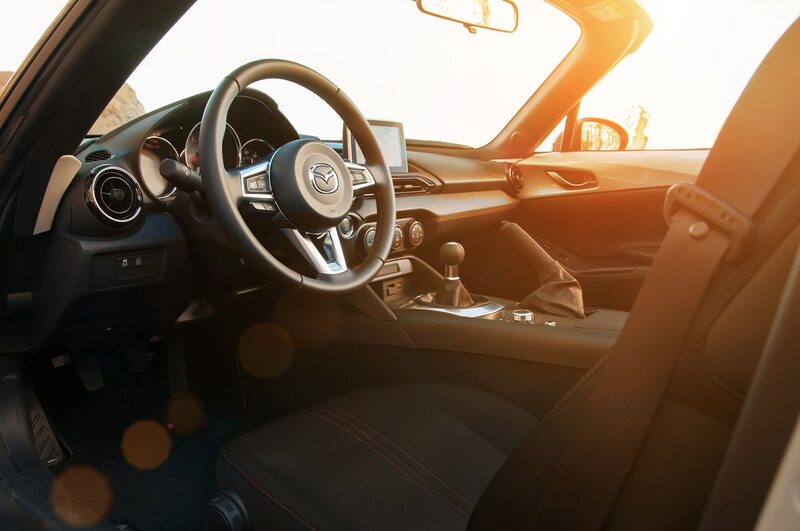 “We wanted a higher level of interior treatment, while continuing to focus on the driver,” Jenkins says, with much-improved finishes, brightwork, and graining. 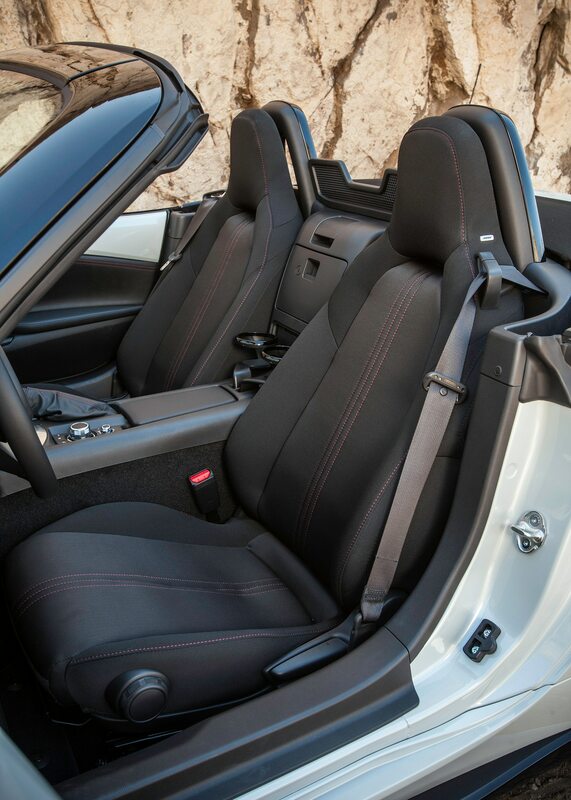 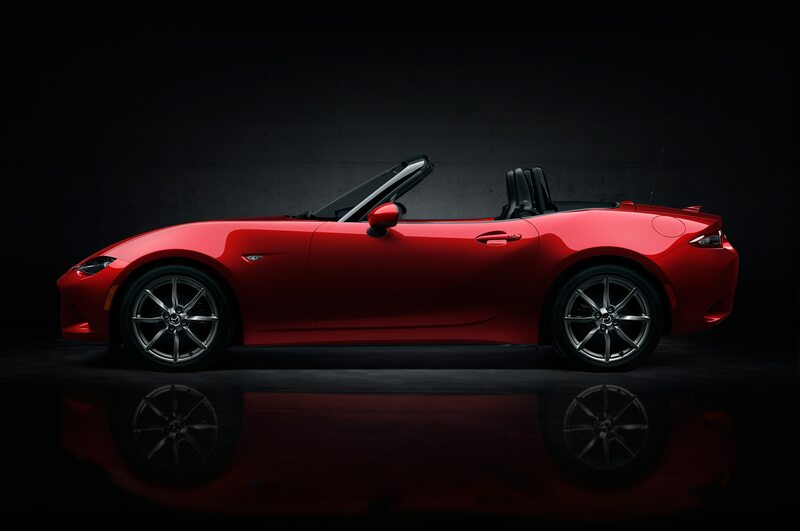 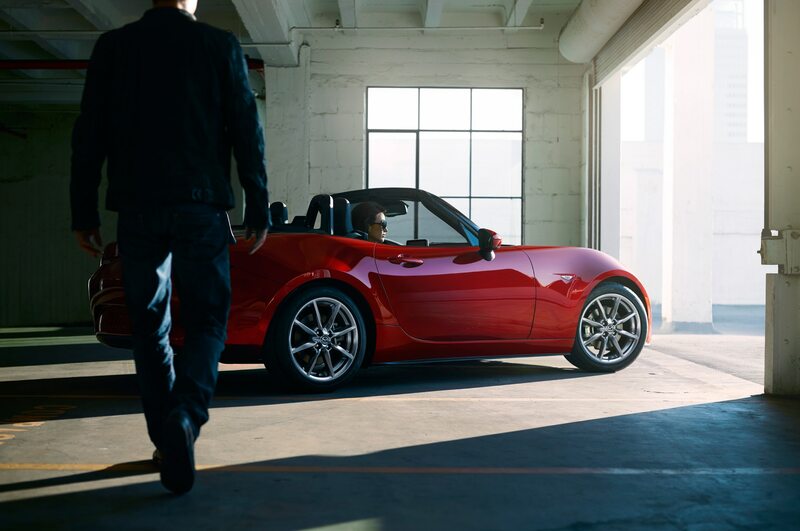 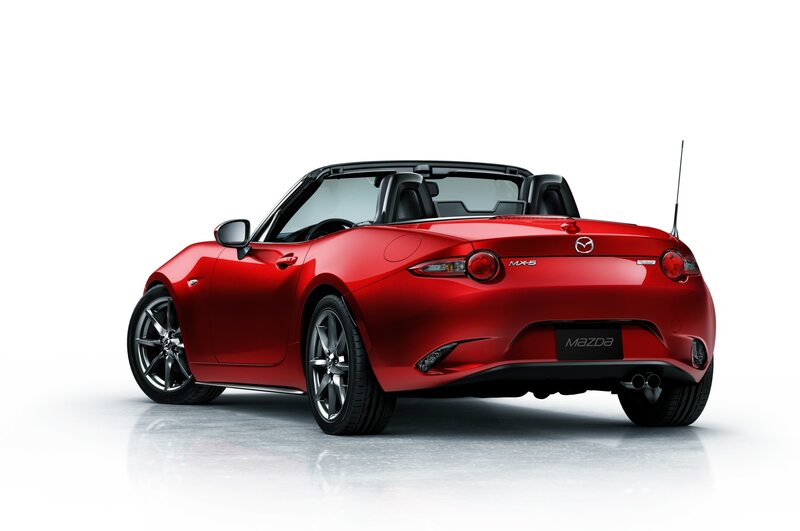 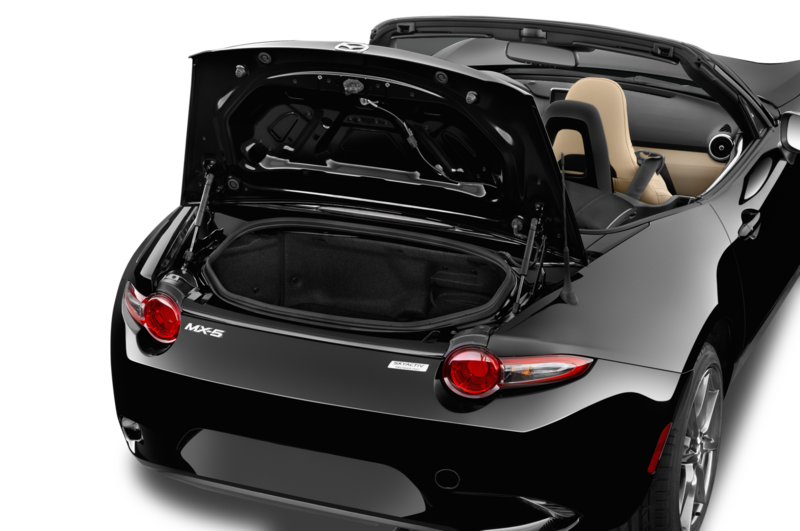 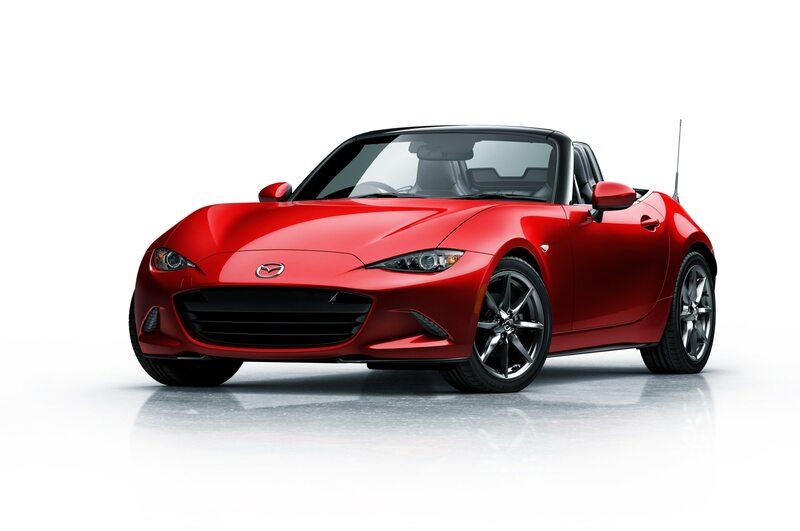 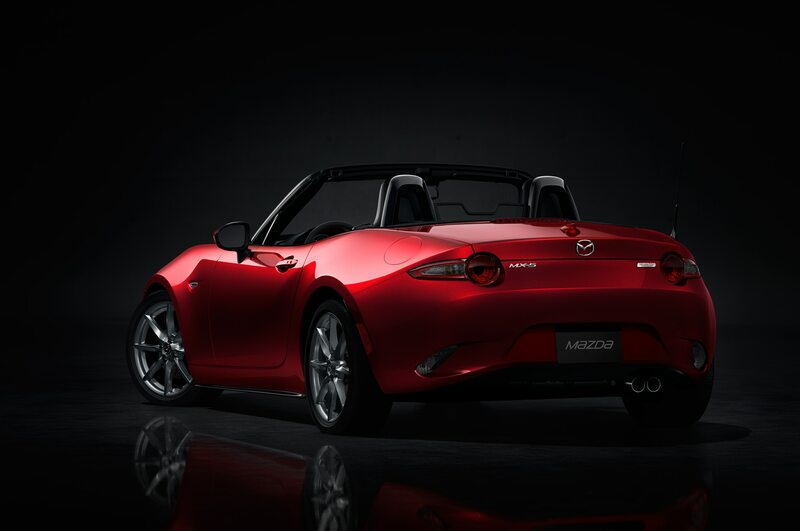 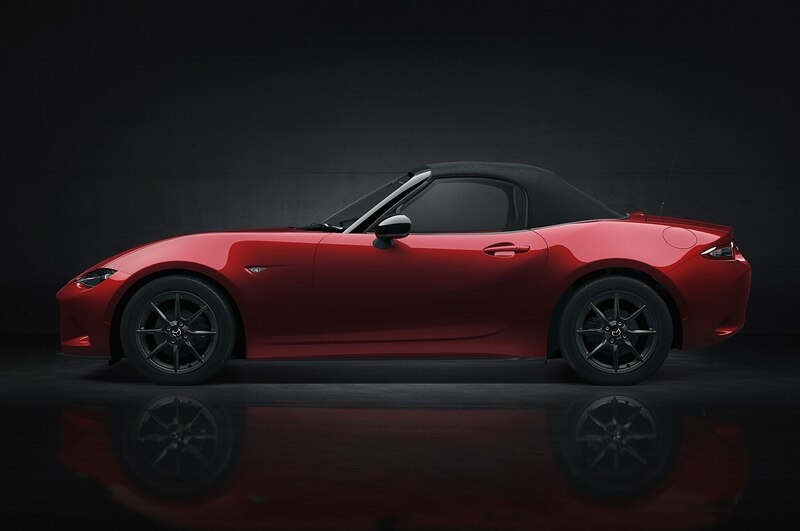 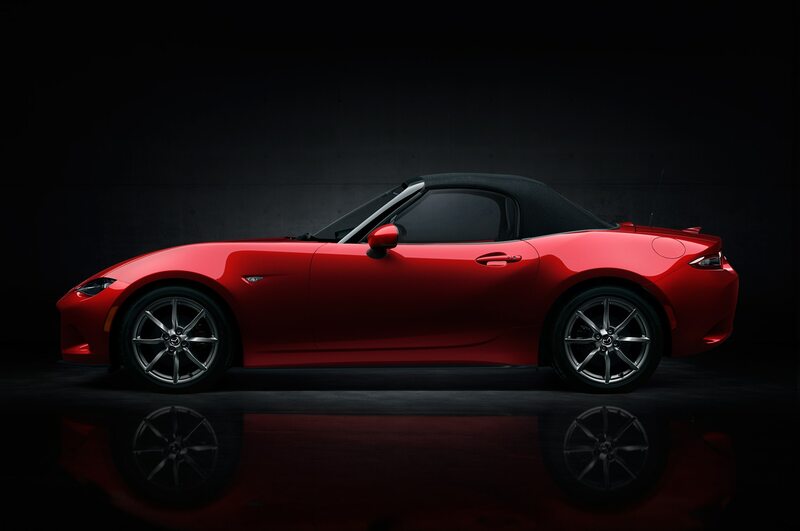 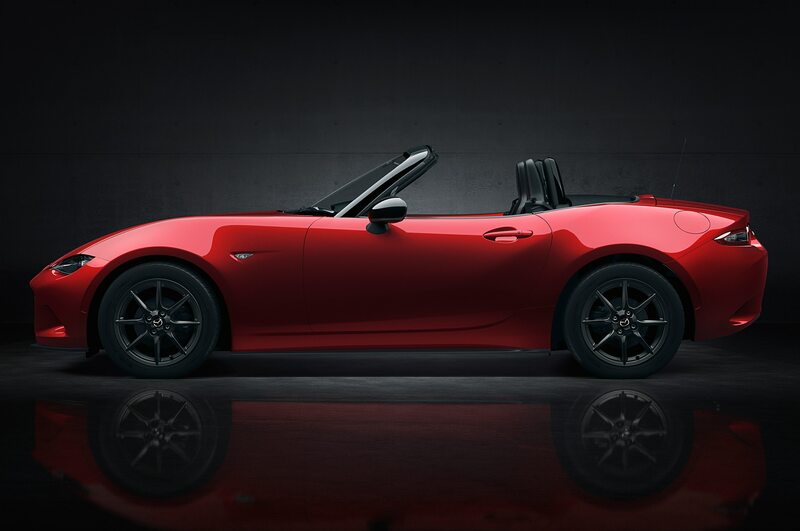 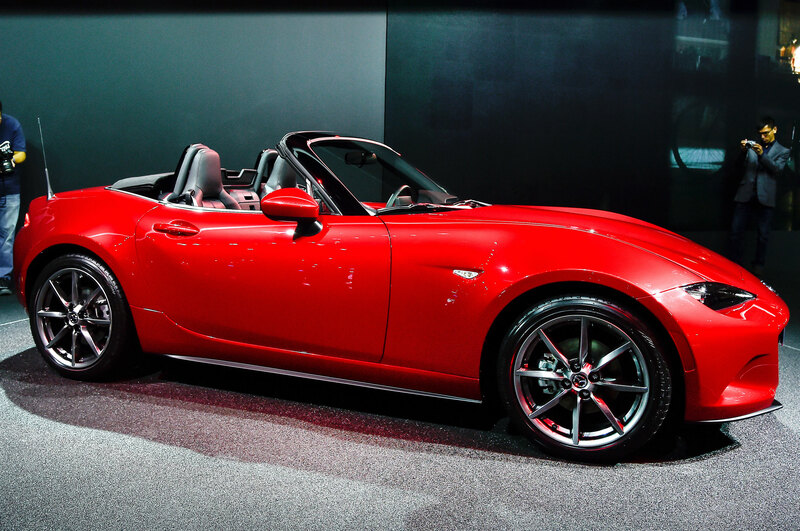 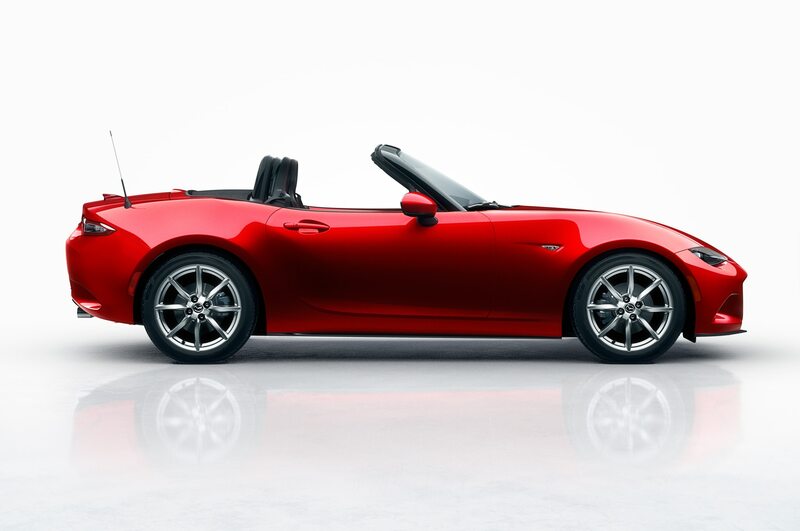 While Mazda wouldn’t discuss details like interior dimensions or trunk capacity, the new Miata has roughly the same interior package as the outgoing car, even though overall height is slightly lower (wheelbase is slightly longer) and the cabin is further back on the chassis. 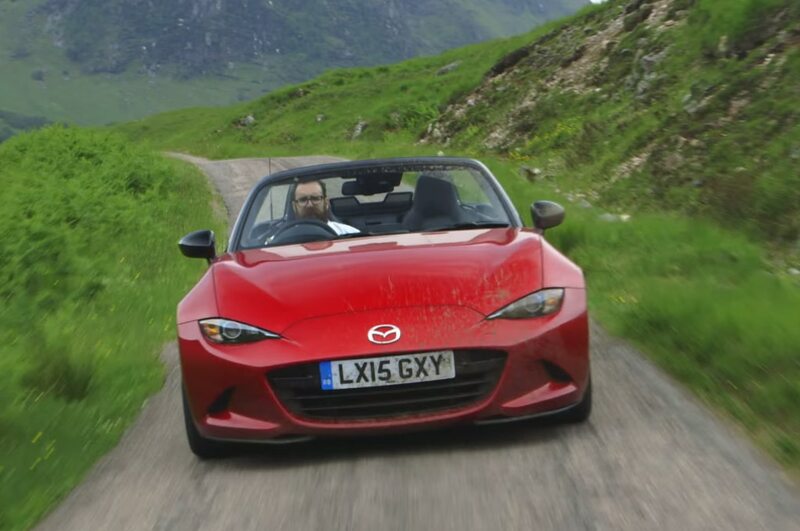 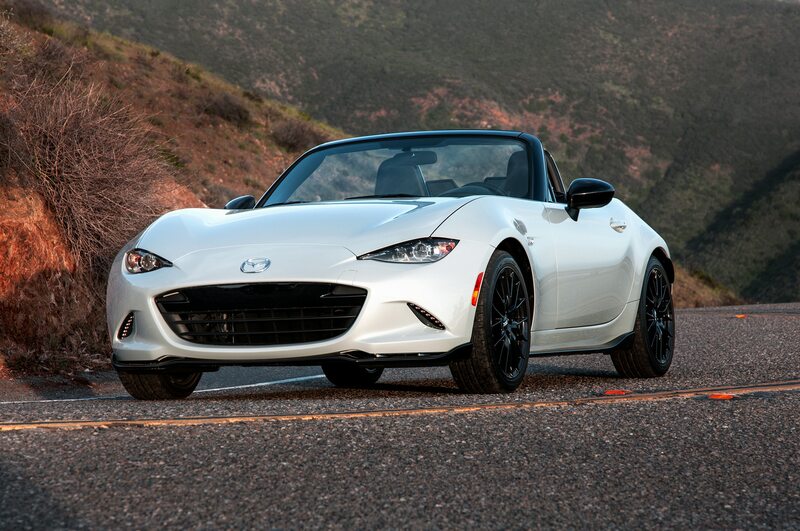 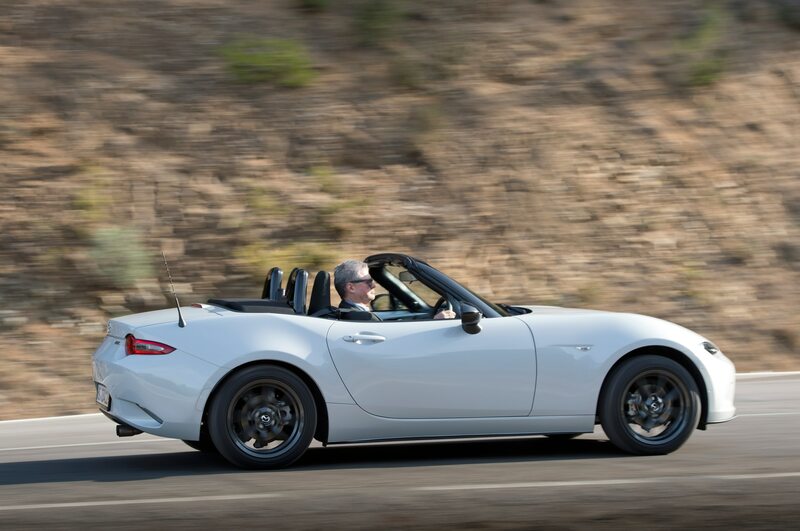 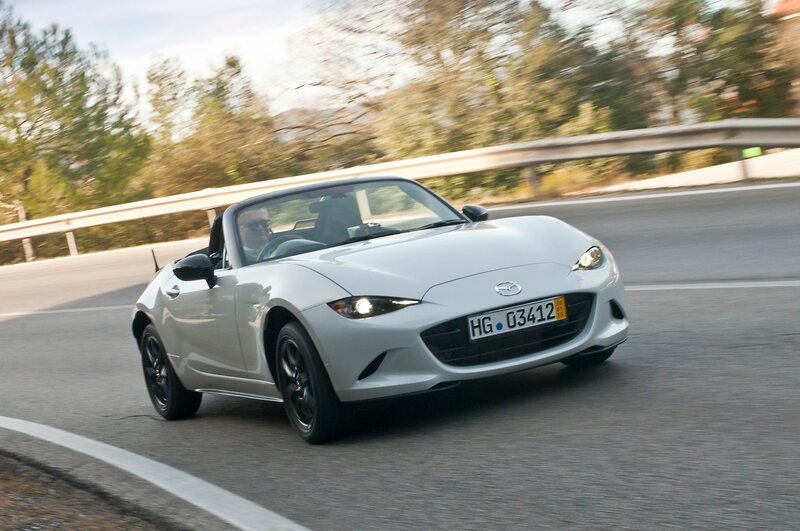 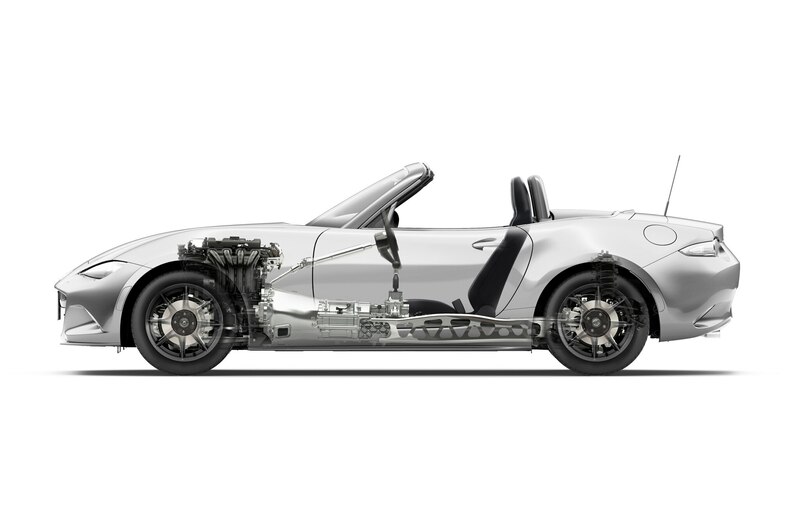 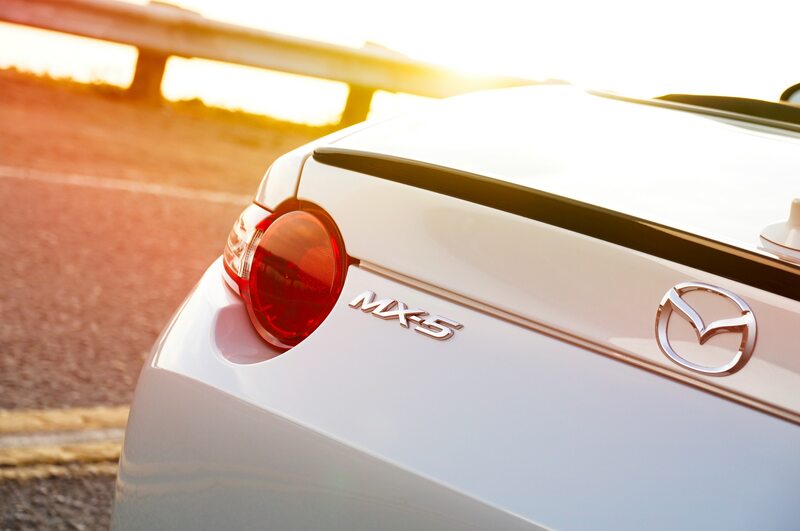 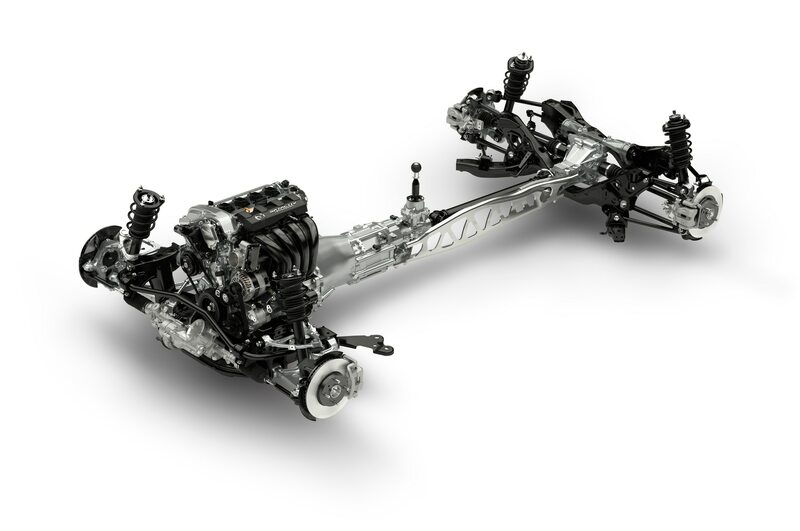 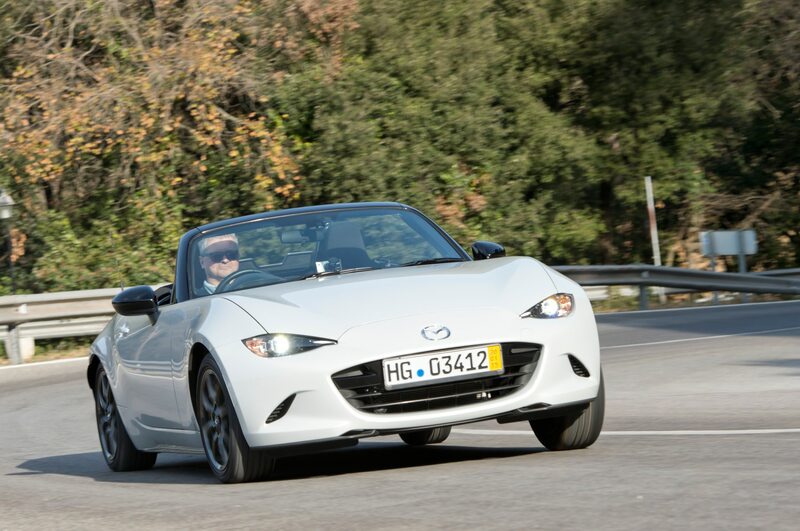 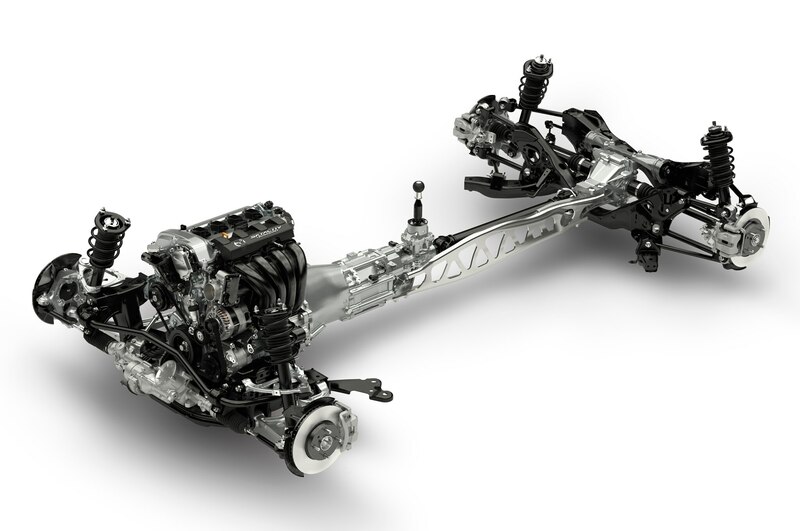 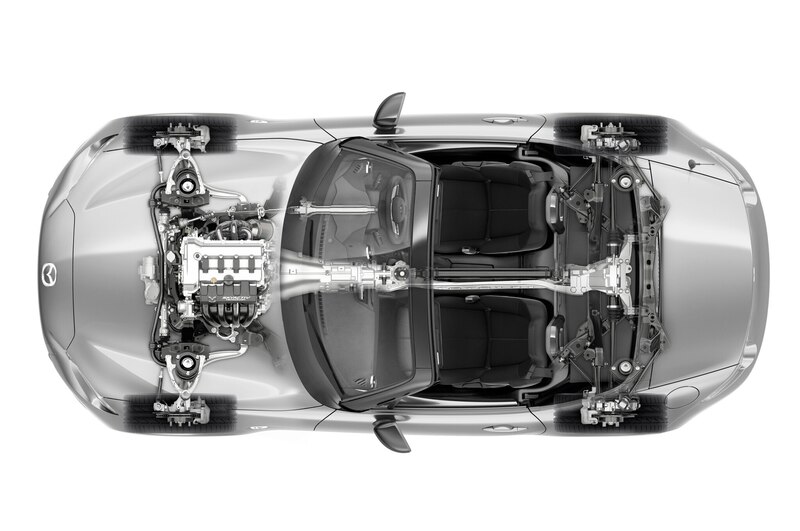 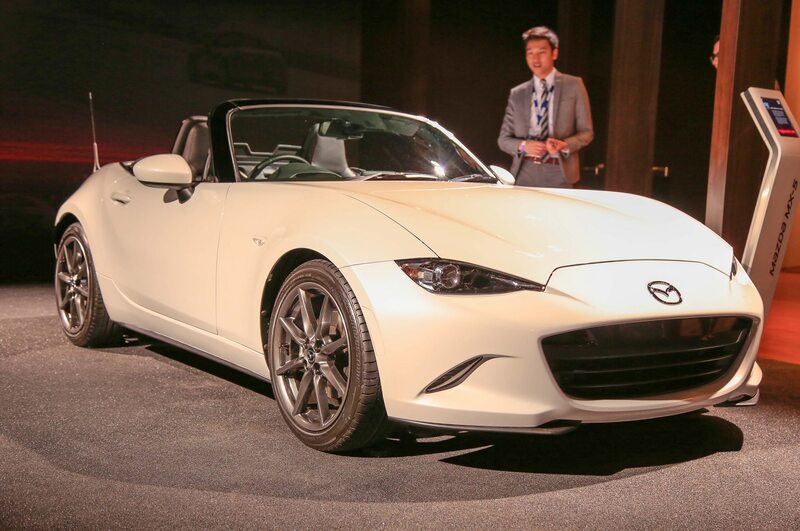 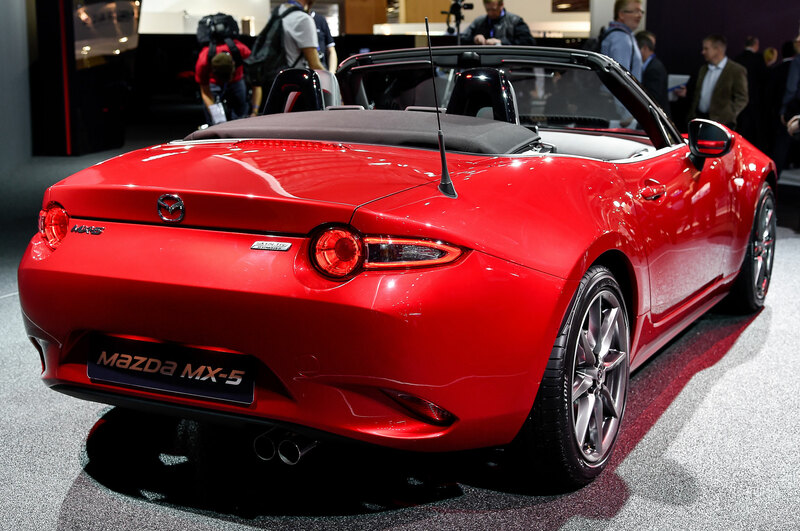 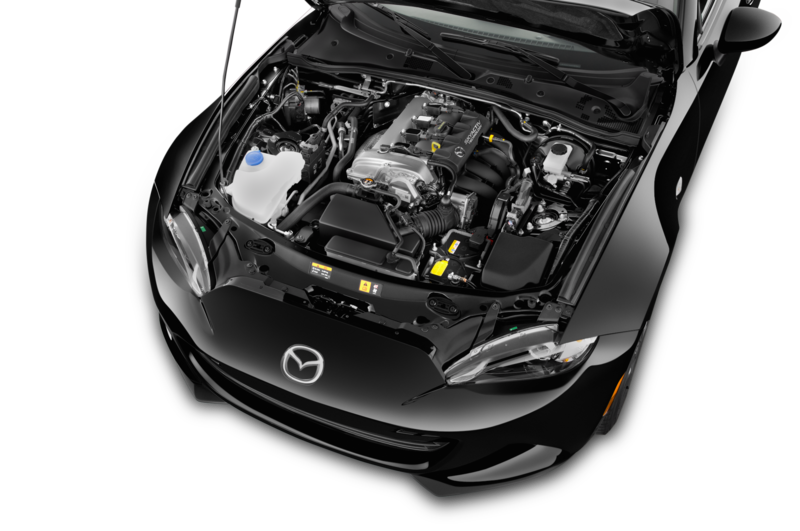 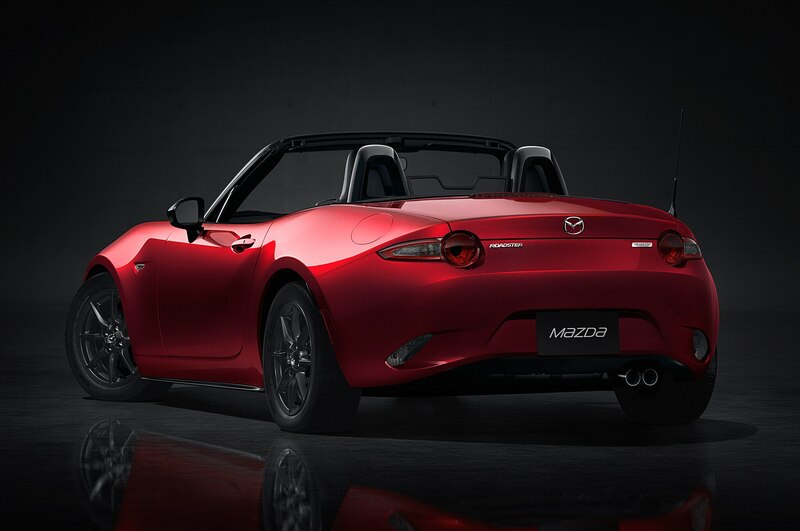 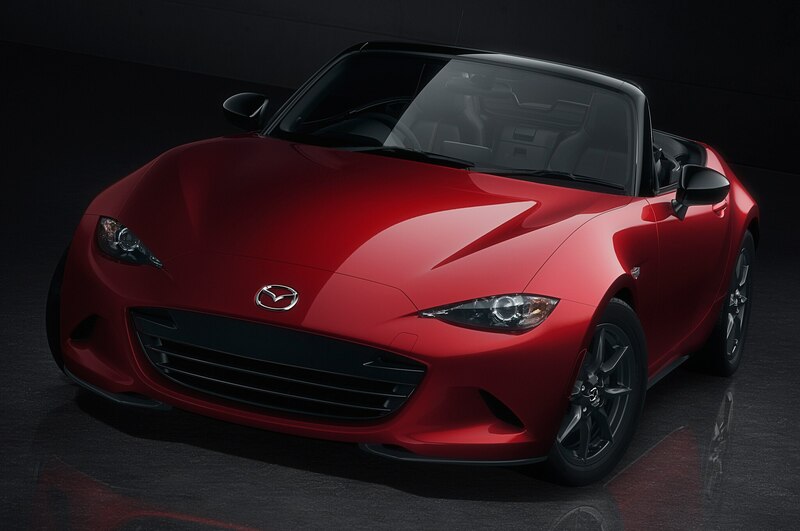 With its long, sloping hood and shorter front overhang, it appears the engine of the 2016 MX-5 will be placed in more of a front-mid-engine position. 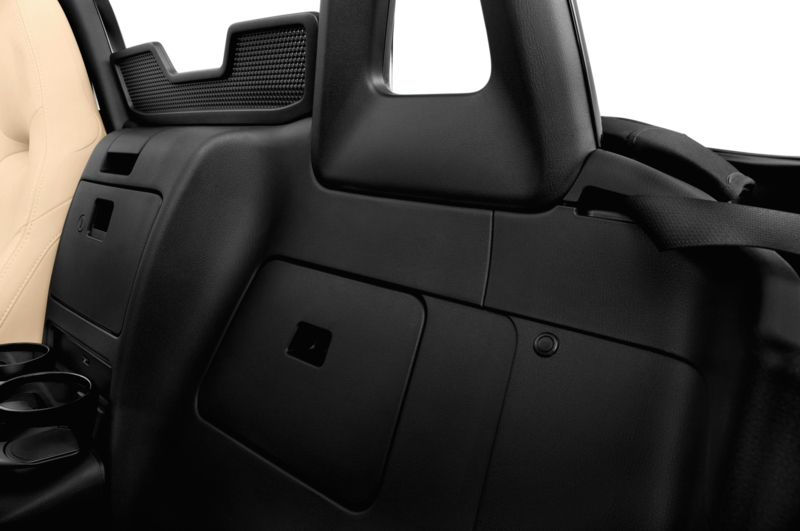 This would improve the car’s balance (now reportedly at 50/50) while solving the problem of how to meet strict pedestrian-protection standards in Europe. 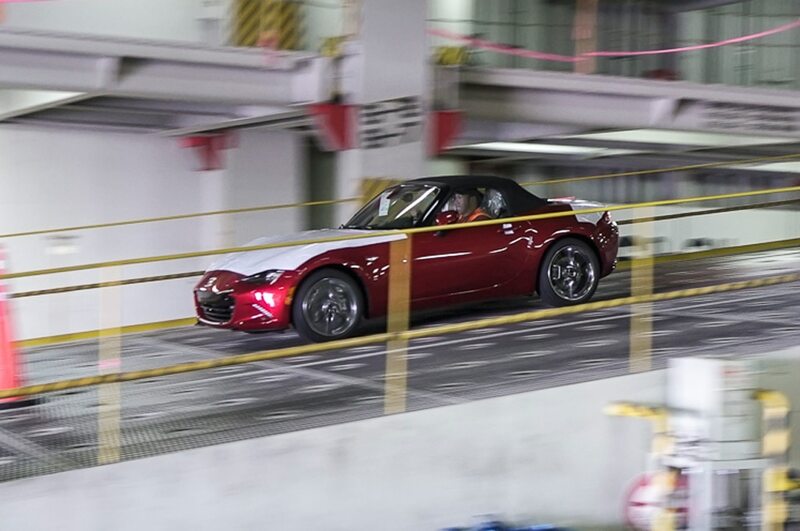 “A great deal of attention was put on downforce, to eliminate lift,” Jenkins says. 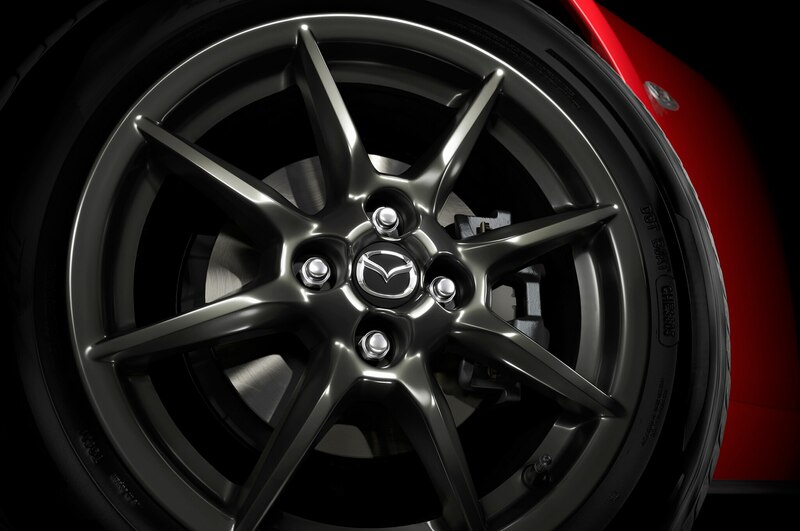 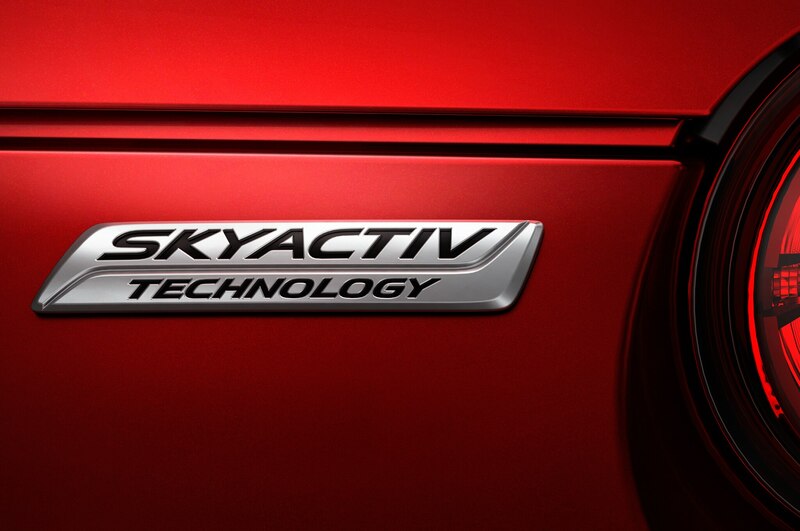 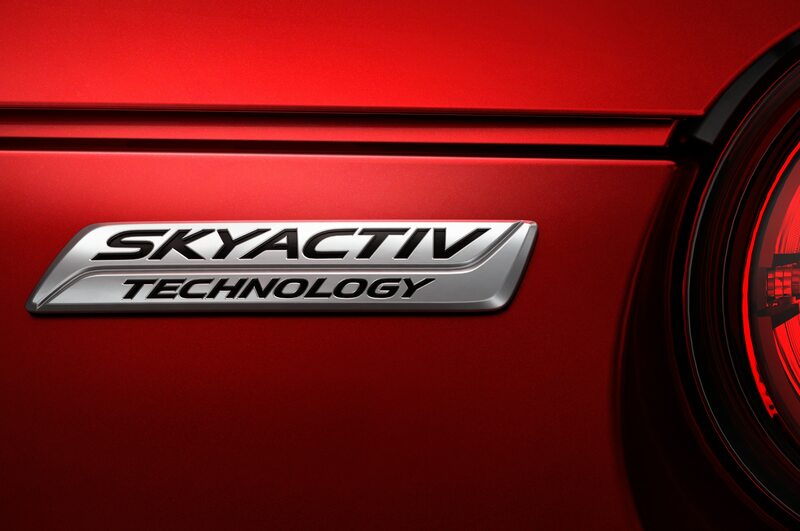 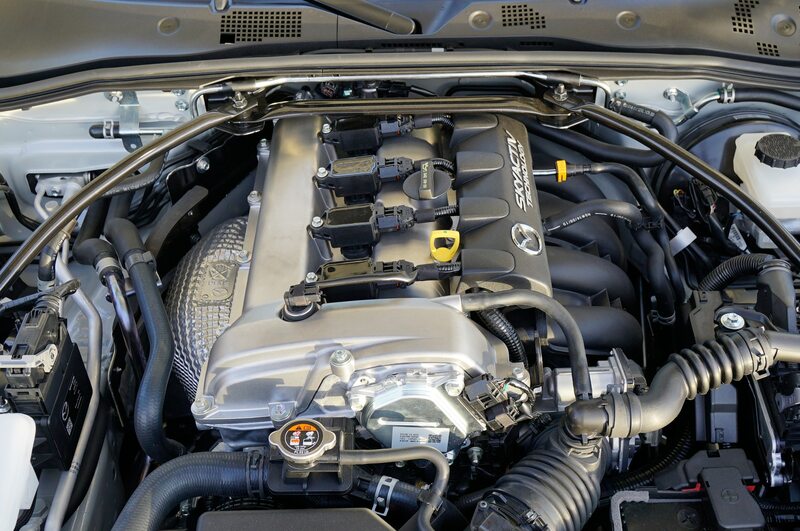 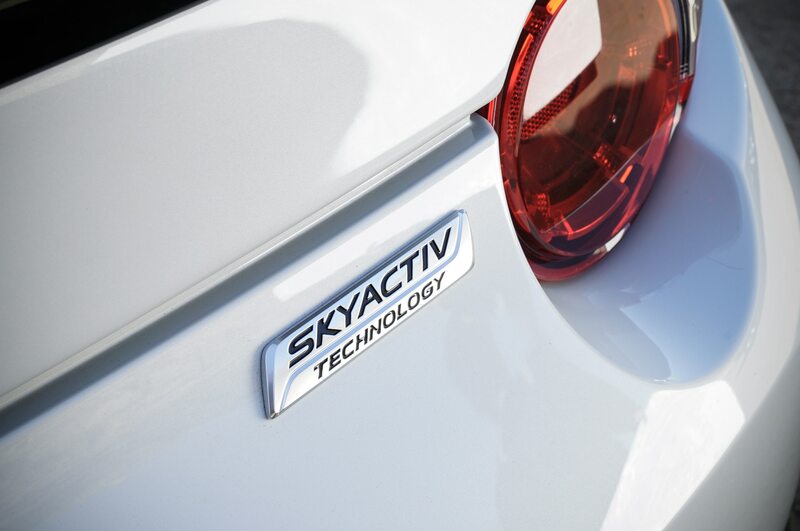 We’ll have to wait for official word on the power numbers for the car’s 2.0-liter Skyactiv-G inline-four. 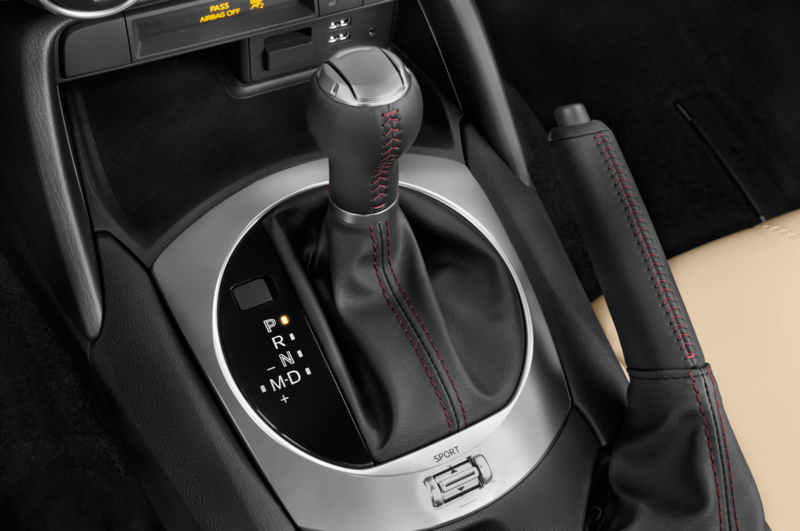 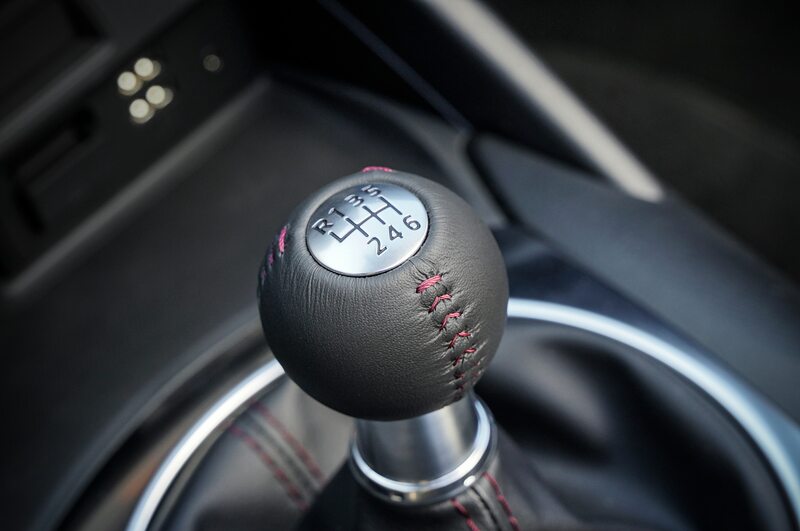 Transmission choices are likely to carry over, including a six-speed automatic and six-speed manual (the five-speed manual is likely history). 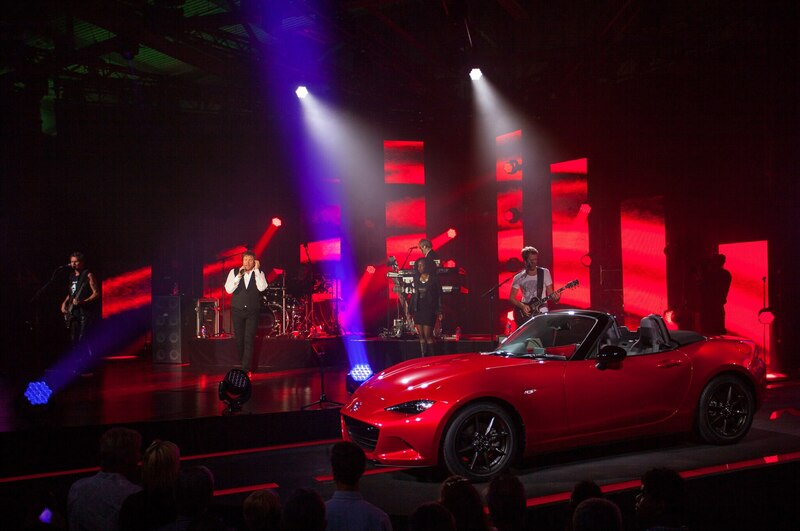 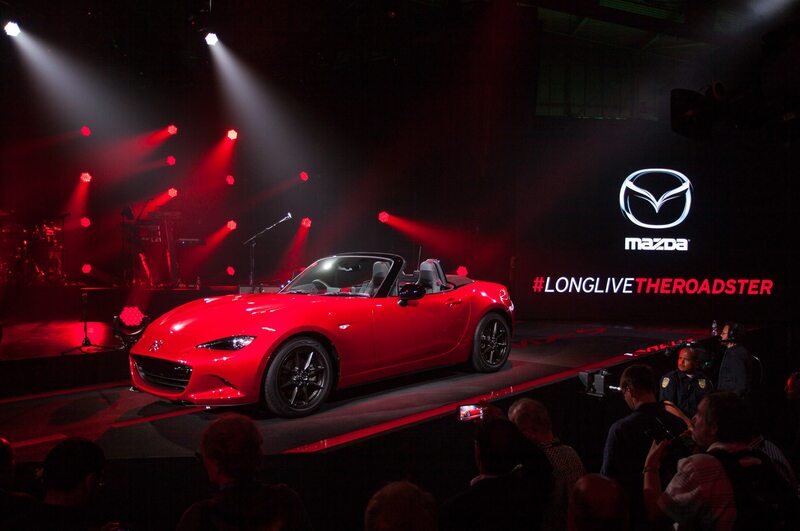 The reveal of the Fiat Spider, using the Mazda ND platform but with its own styling and engine (very likely turbocharged), is expected by the end of 2015. 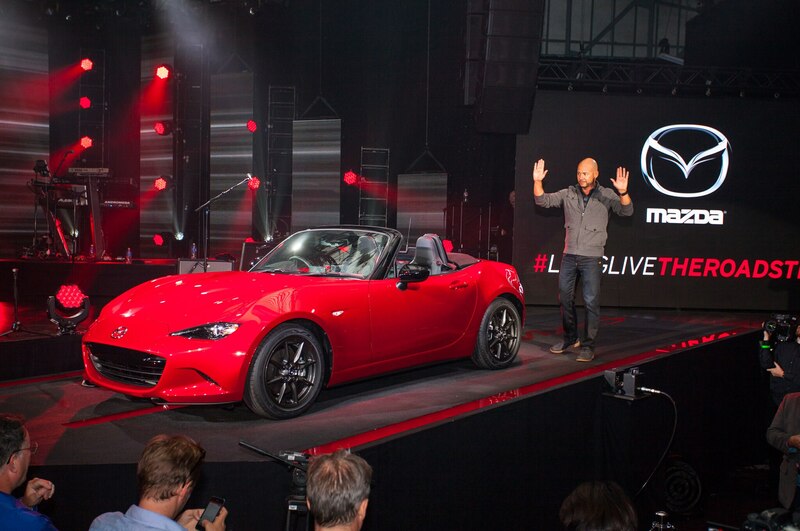 If Mazda did nothing else Wednesday night, it reassured the faithful that the fourth-generation Miata will be as pure a sportscar as the first, though as Bob Hall, product planner for the first car points out, it is much more successful in carrying out its mission because it meets all the modern safety, emissions and fuel efficiency requirements without compromising its sporting flavor. 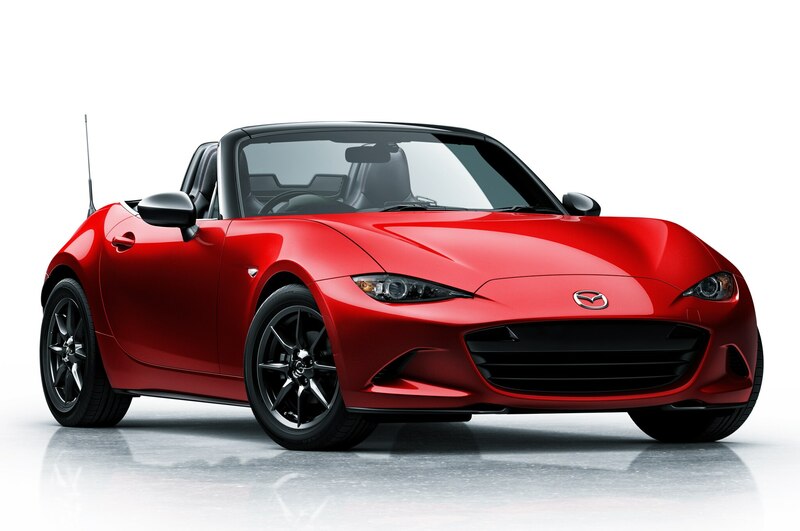 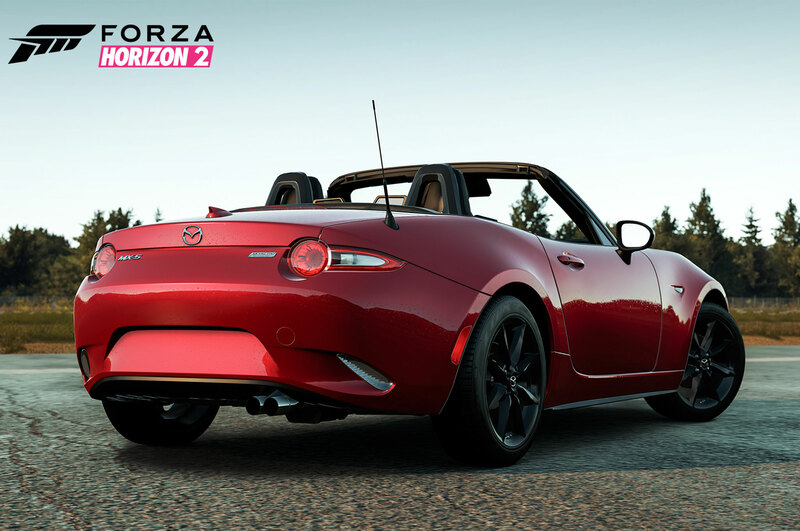 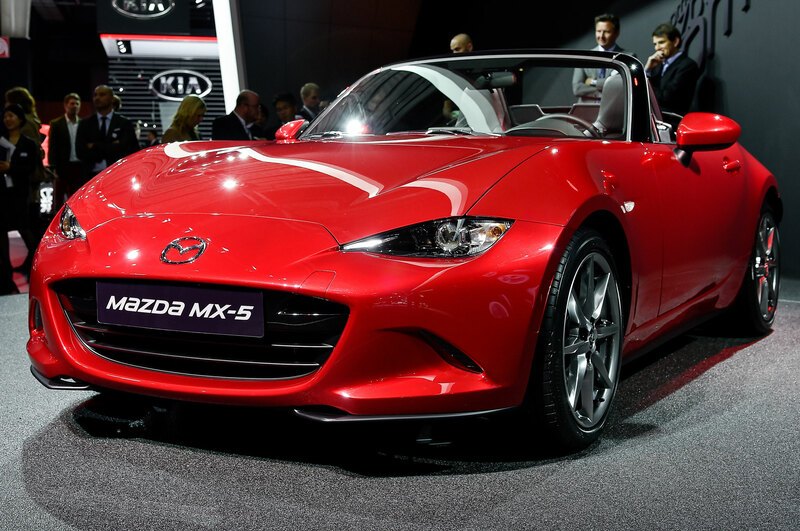 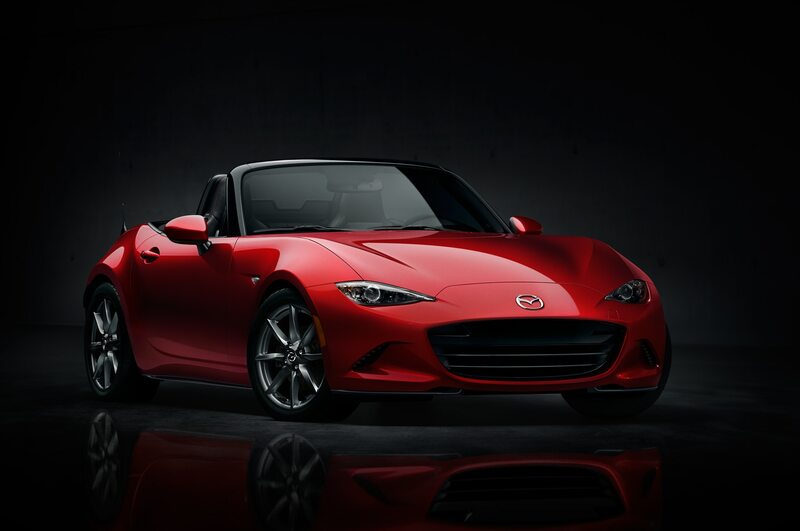 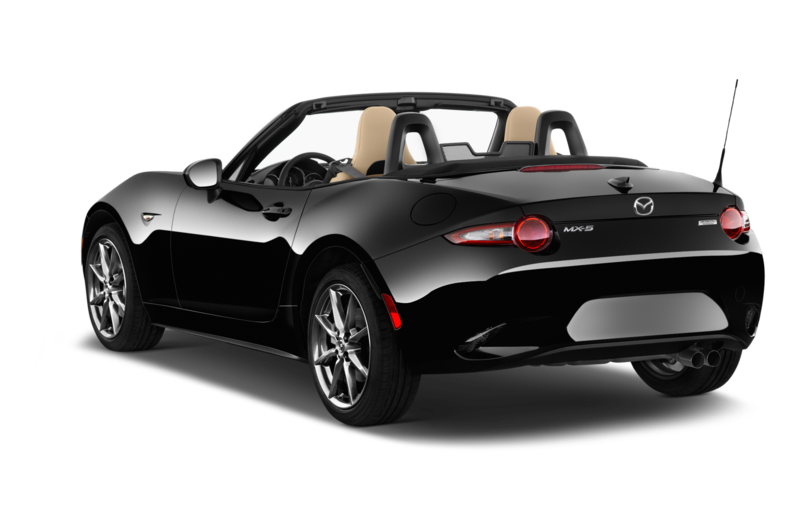 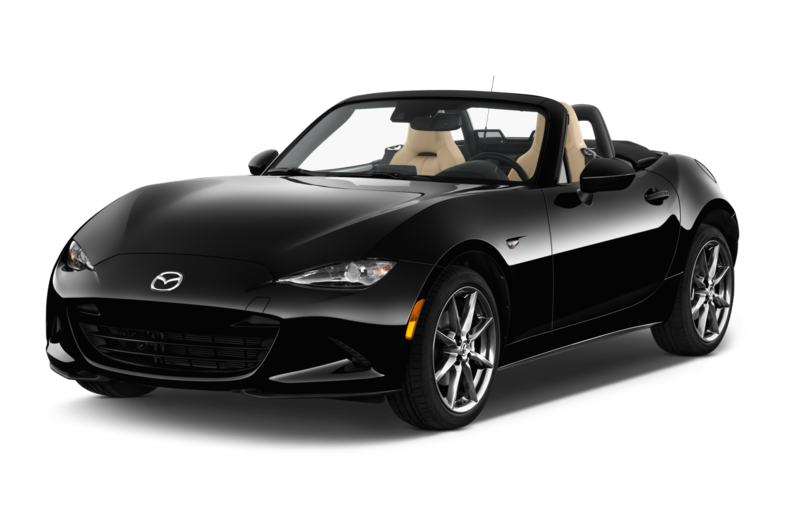 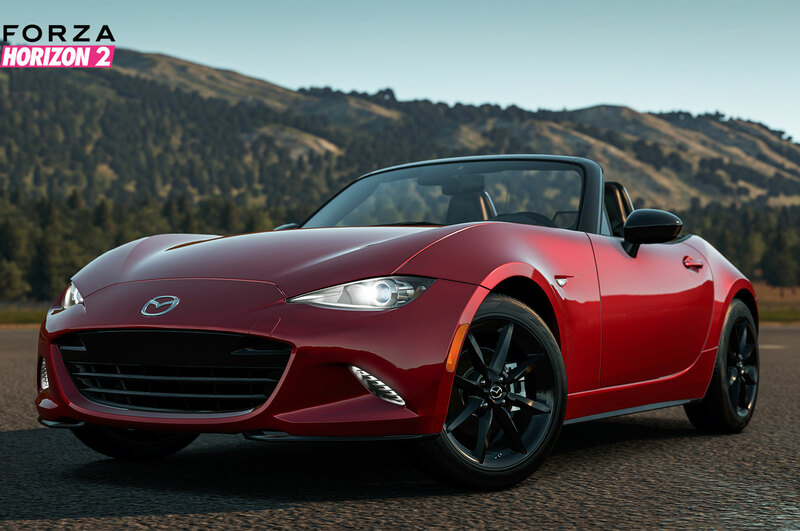 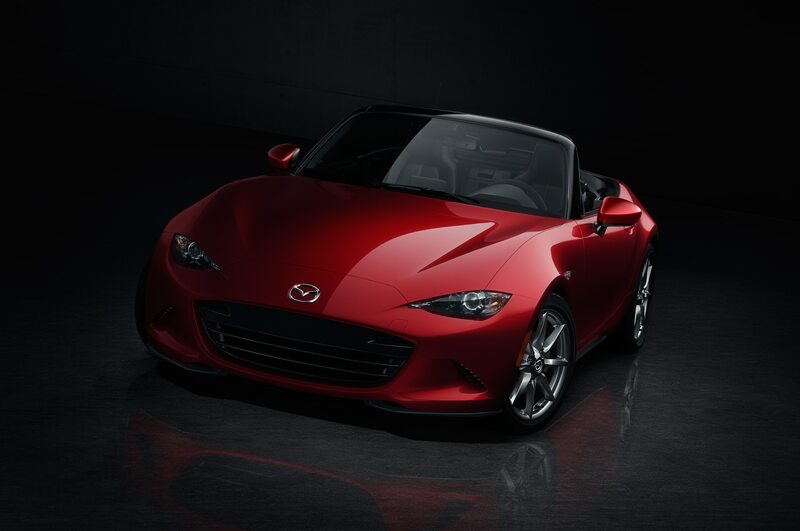 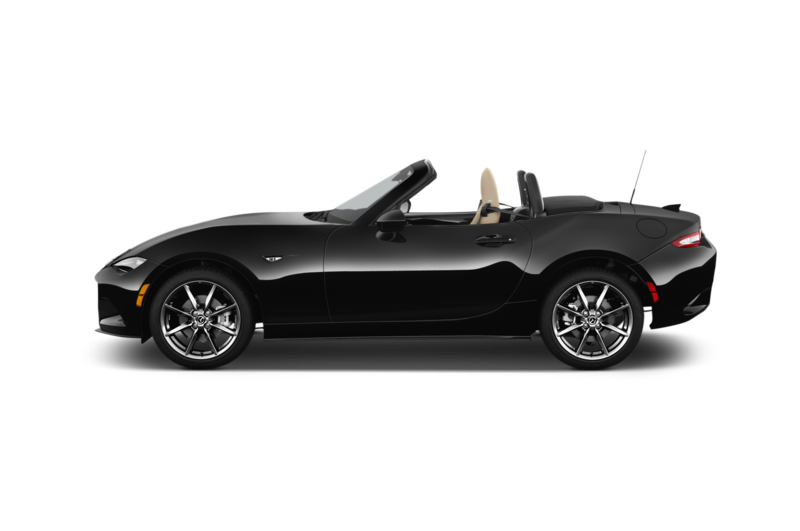 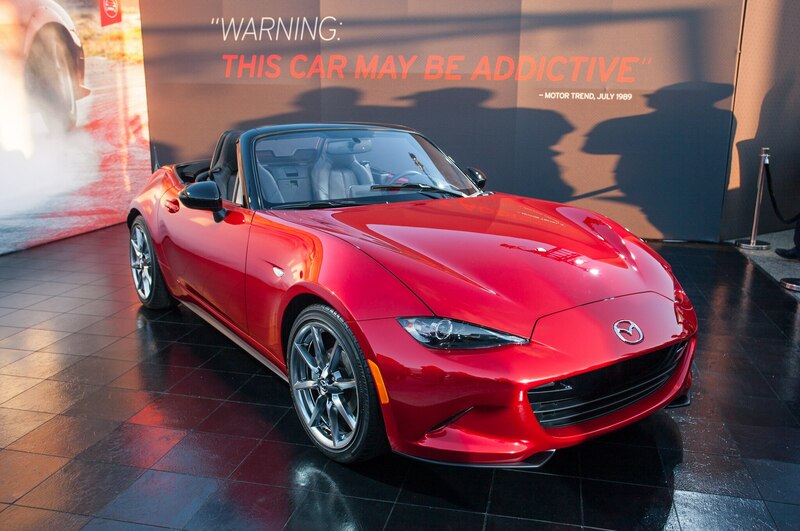 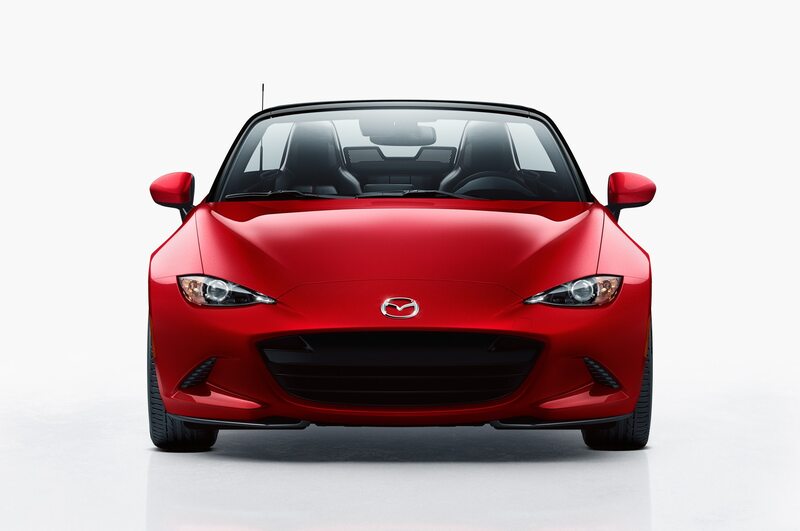 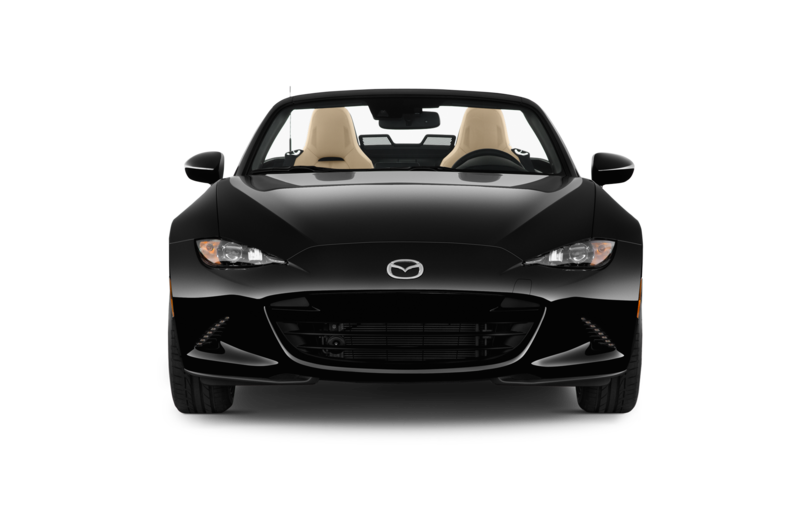 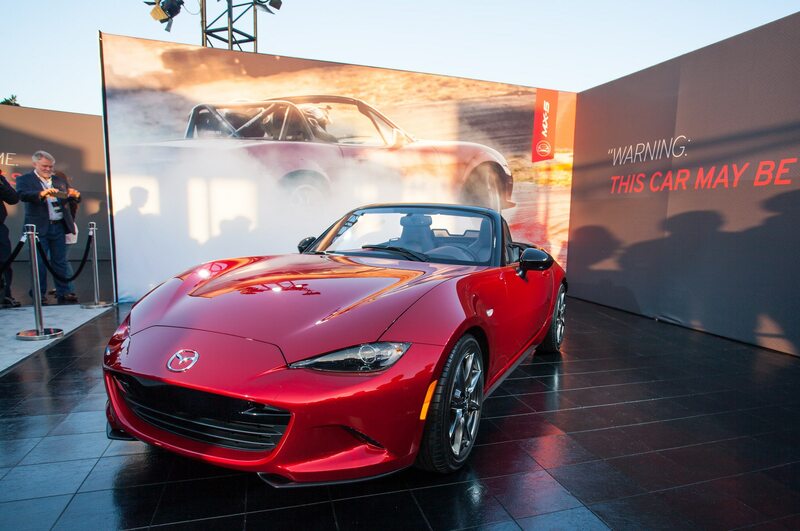 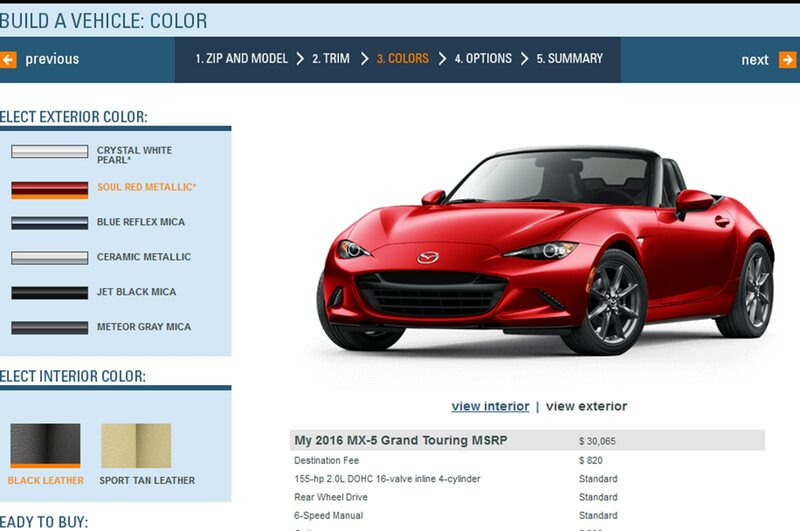 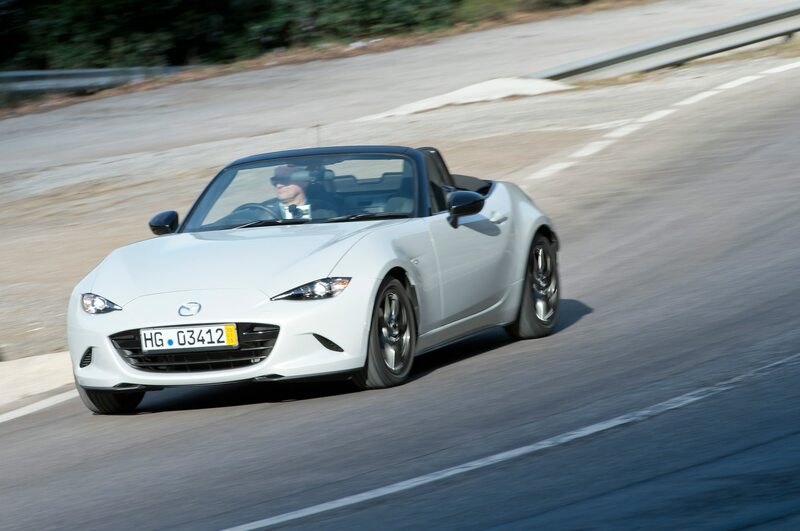 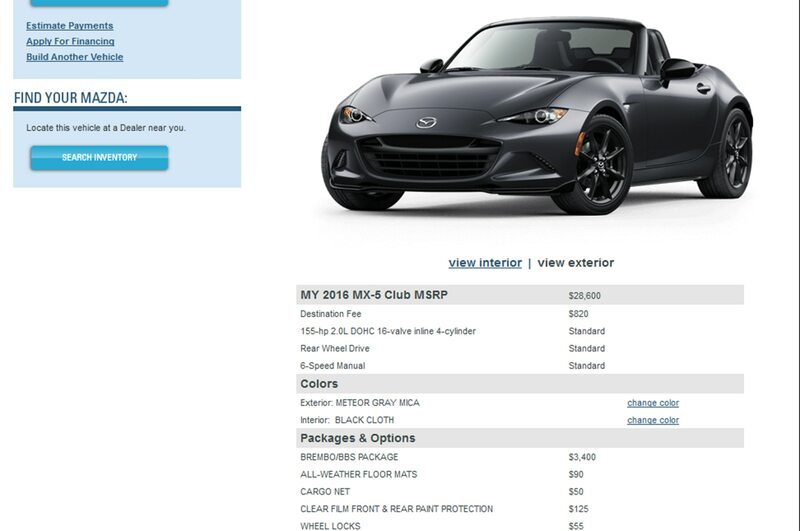 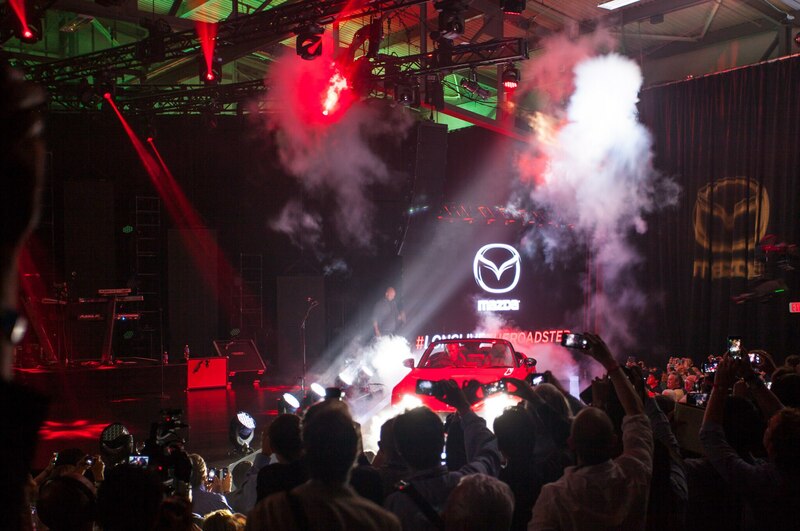 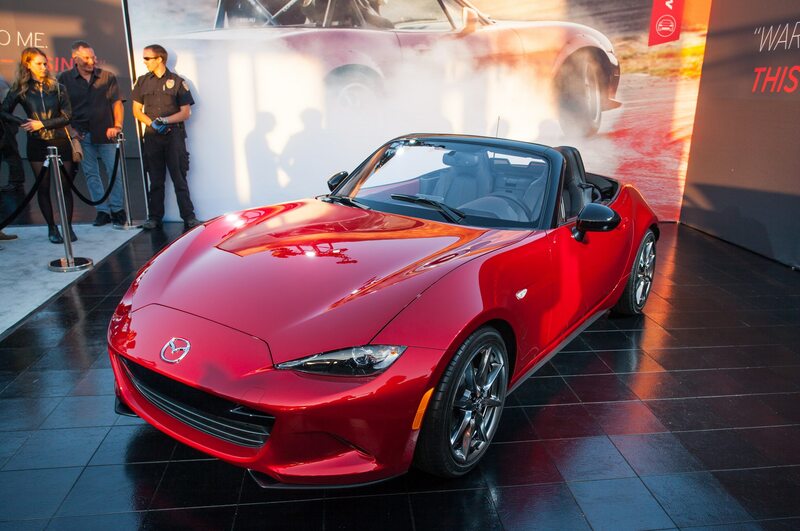 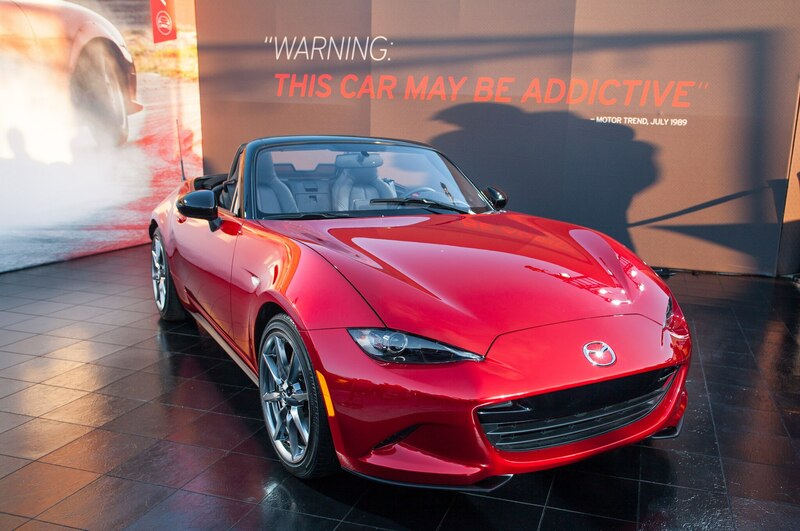 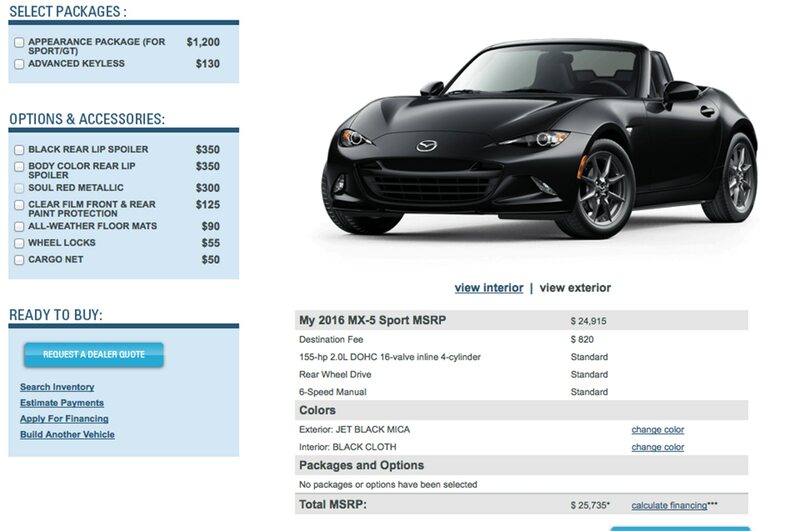 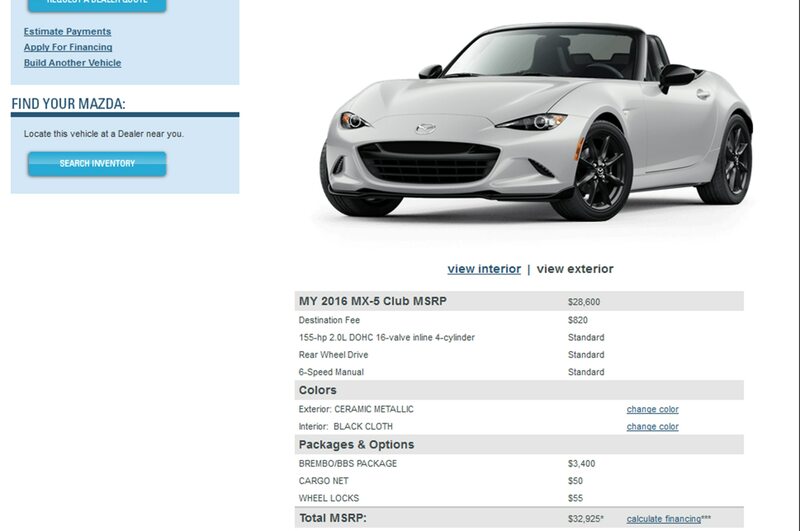 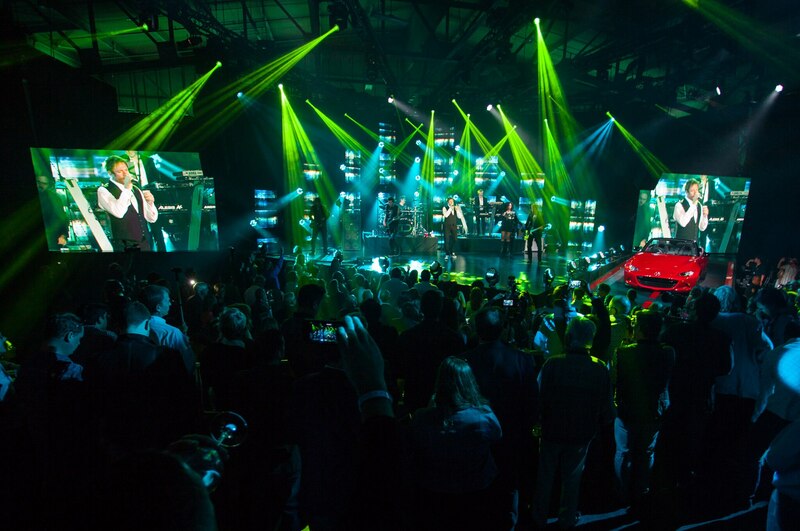 The event also made clear that the new 2016 Mazda MX-5 Miata is at least as sporty and good-looking, if not more so, than any of the first three, and in automotive enthusiast circles at least, the interest level is as strong as that of any new iPhone.